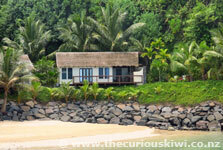 Talofa, if sleeping beach side in a rustic fale on the cheap appeals then Samoa could be the destination for you. 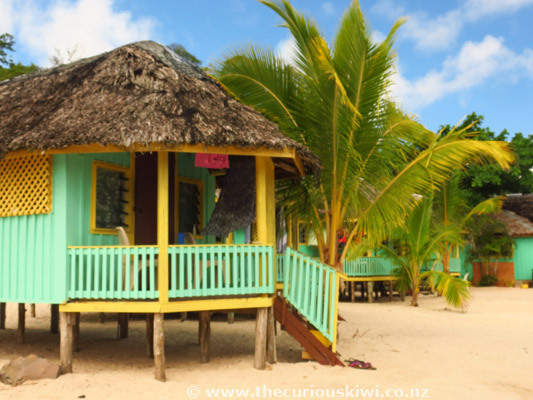 It's not the place to party up large and late on the beach though, it's a place to snorkel, swim, eat well and acclimatise to island time. Nature made attractions on the main island of Upolu include the stunning To Sua Ocean Trench and Papase'ea sliding rocks (water level permitting). Please note - Most of the land is owned by villagers, ask for permission before you go exploring, it's also likely you will need to pay a small fee. 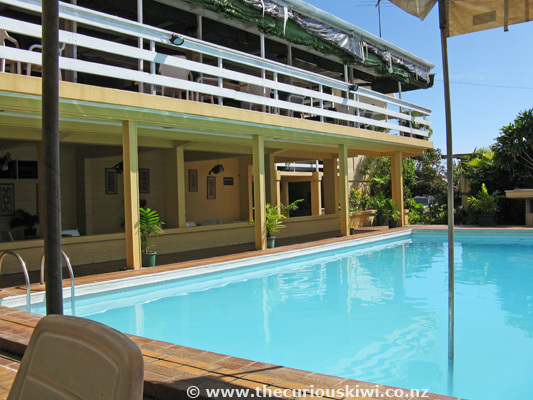 If you're looking for the kind of holiday that involves lying by the pool with a book and beverage in hand see Resorts and Deluxe Accommodation and Superior Accommodation via Samoa Tourism Authority. If you are a solo budget traveller, the rustic open sided beach fales are particularly good value because charges are usually per person rather than per fale, and rates usually include breakfast and dinner. 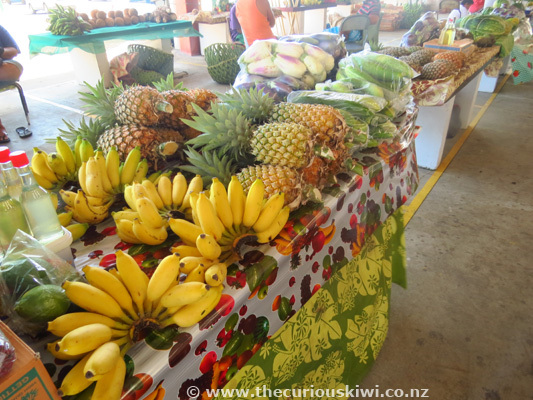 The following information and photos were compiled after our holidays in Samoa in June 2009, October 2014 and October 2016. For additional information about Samoa visit a local travel agent, and Samoan Tourism Authority. Language: Samoan is the official language but English is widely spoken. 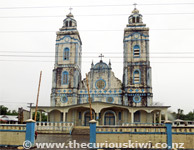 Capital: Apia on Upolu Island. 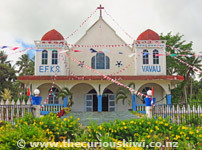 Savaii is the largest island but less populated than Upolu. 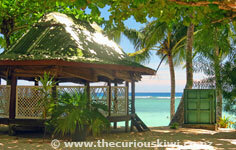 Population: Approximately 190,000, 75% live on Upolu. 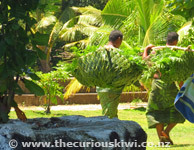 Travel Warnings: Visit Safe Travel to see if there are any travel or health related warnings for Samoa. Sunday: Sunday is dedicated to church, family, food and rest. 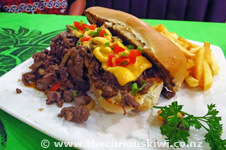 Bars and many eating establishments will be closed. Transport: Cheap public buses, numerous good value taxis, car, and scooter hire. 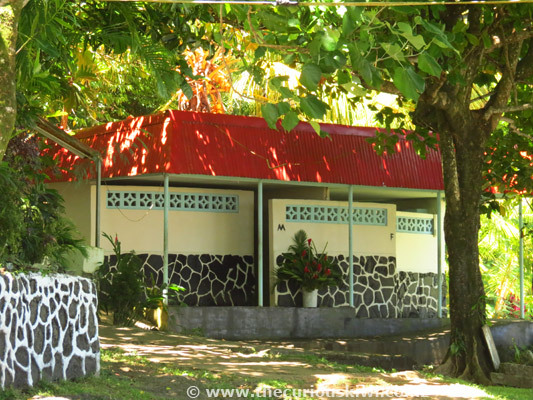 Faleolo International Airport: 35km from the capital Apia on Upolu Island. An information booth is open for arrivals, you can purchase SIM cards from the Digicel kiosk. 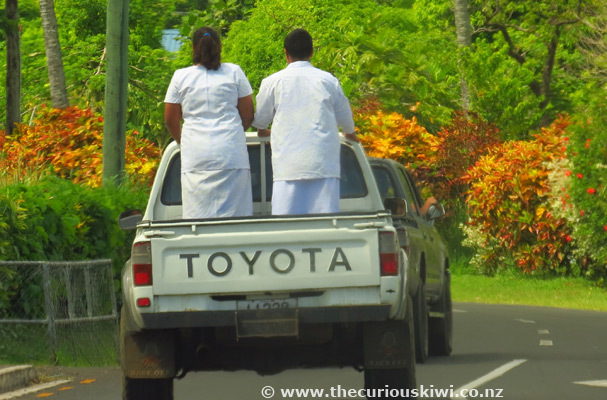 A taxi from the airport to Apia is 60-70 tala. Read the news: Samoa Observer. 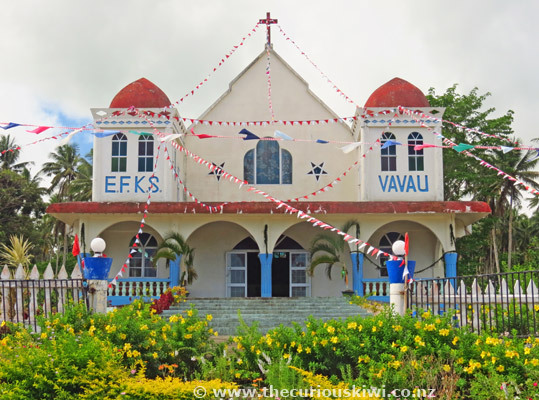 Banks: ANZ has branches in Apia (Upolu) and Salelologa (Savaii), ATMs are also available. 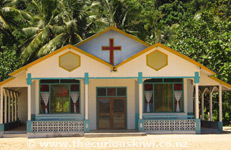 (Westpac is no longer in Samoa). Maps and Visitor Guide: The Visitor Information Centre on Beach Road in Apia has free visitor maps (Apia doesn't have a lot of street signs so it's a good idea to take your GPS enabled smart phone and use Google maps to help you find your way around), and a Samoa Today & Tonight Guide. 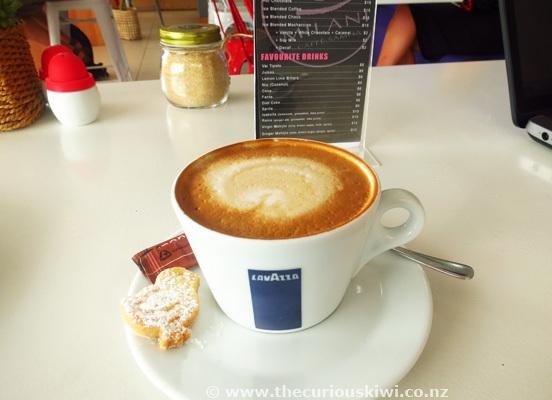 You may also find the maps and guides in the departures area of Auckland Airport and arrivals at Faleolo Airport. 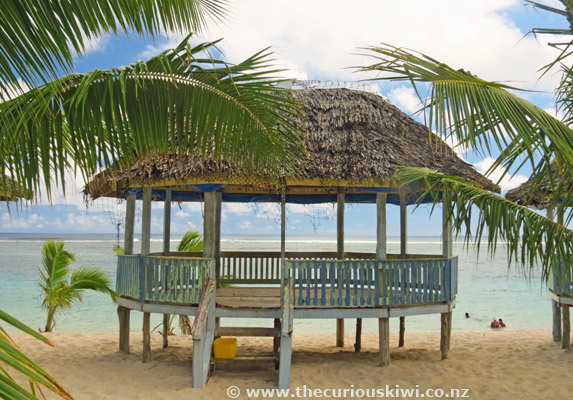 In 2016 there were only a few brochures for attractions and accommodation in Samoa at the Visitor Centre and the Today Tonight Guide will only feature those that have paid to advertise, so it's worth doing some research before you leave home. 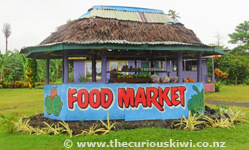 Apia, Samoa's big smoke is where you will find Fugalei Fresh Produce Market on Fugalei Street. 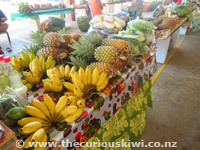 The market is an airy space filled with locals, fresh produce and handcraft / souvenir stalls. 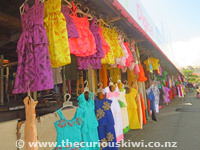 On Beach Road is Savalalo Flea Market - it's not a flea market as we know it in New Zealand, but a big collection of small stalls selling handcrafts, souvenirs, clothing, carvings etc. 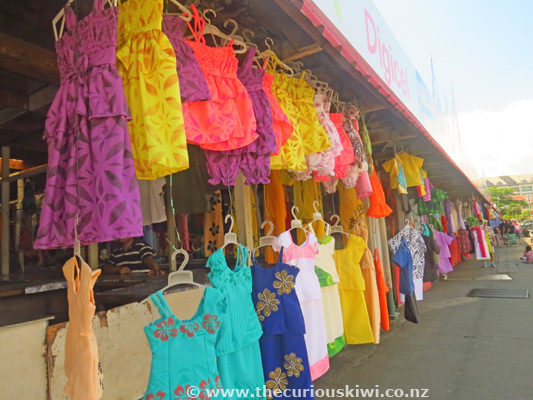 The flea market is the best option for souvenir shopping*. At the back of the flea market, stalls selling fast food do a roaring trade. There's also a Fish Market, best visited from 6am on Sunday if you're an early riser. Big, bright buses also depart from behind the flea market and take passengers in all directions around Upolu, the destination is painted on the front of the bus. Buses leave when they're full to overflowing, pay the cheap fare as you leave. 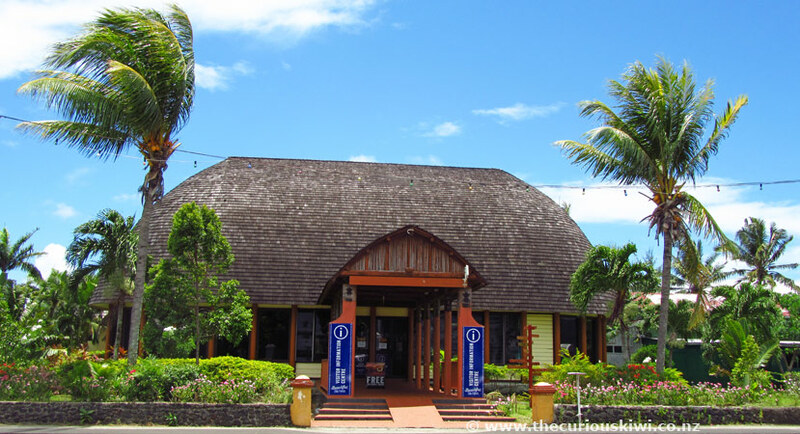 If shopping for gifts and locally made products is on your agenda in Apia, as well as the markets, there are a few galleries and shops to visit: The Vanya Taule'alo Gallery in Taumeasina Village (Legends Cafe adjoins the gallery, it's walking distance from Taumeasina Island Resort). 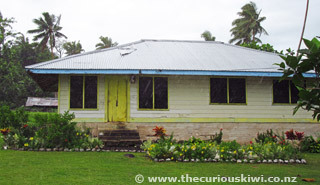 On Cross Island Road you will find Tiapapata Art Centre, and Mailelani Samoa. 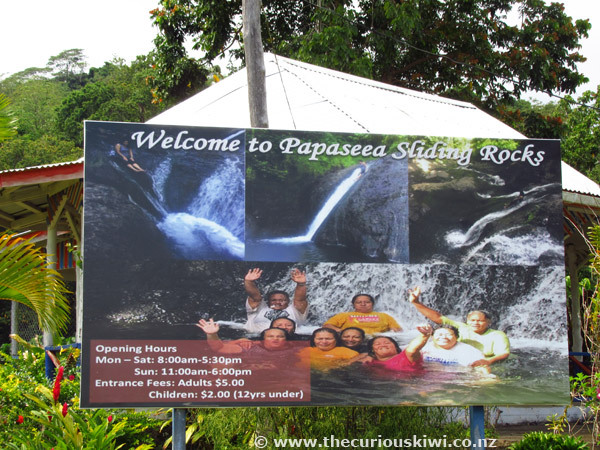 On the way to the Papase'ea Sliding Rocks is Plantation House in Alafua Village. 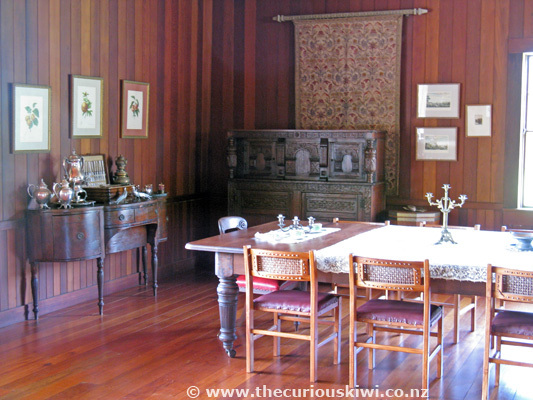 The Museum of Samoa is divided into four small rooms - Environment, Pacific, Samoan Culture, and Samoan Prehistory. Look for signs on the doors on the ground and first floor inviting you to enter. Admission is free and the museum is open Monday-Friday, 9.30am - 4pm. The museum's Facebook page is worth a visit. It's best to visit Palolo Deep at high tide to avoid getting cut and grazed by rocks and coral, and to avoid damaging the coral. The reef is about 100 metres or so from shore so it's best suited to confident swimmers, reef shoes highly recommended. Trip Advisor reviews will be useful for current information and photos. (Small admission fee, snorkel gear can be hired). 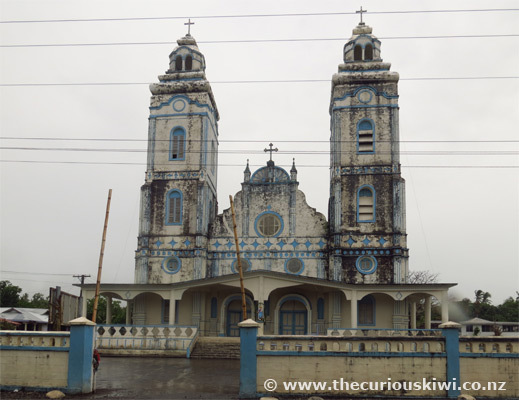 If you're staying in Apia, a short taxi ride will get you to Palolo). 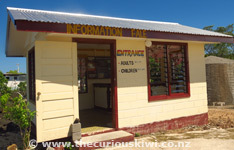 The Visitor Information Centre is on Beach Road and an information booth opens at Faleolo International Airport for arrivals. 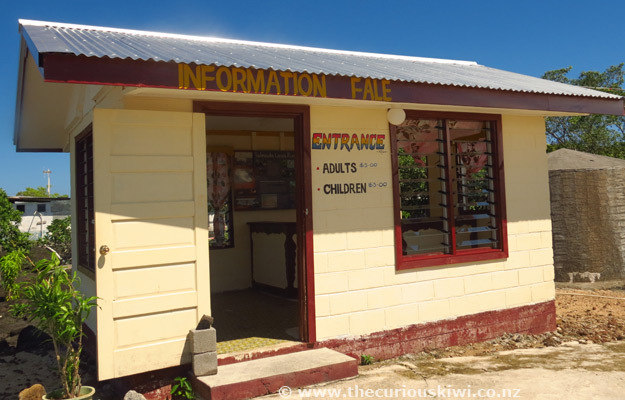 As mentioned previously, there aren't a lot of brochures for accommodation or activities at the Visitor Centre but there are free maps and a Samoa Today & Tonight Guide, it's a good idea to do some research before you leave home. Timing plays a big part in what you will see at the Cultural Village, see their Facebook page for tour times. We timed it wrong and nothing was happening, but see Trip Advisor reviews for what others have to say. If you see a cruise ship in port the Cultural Village should be in full swing. 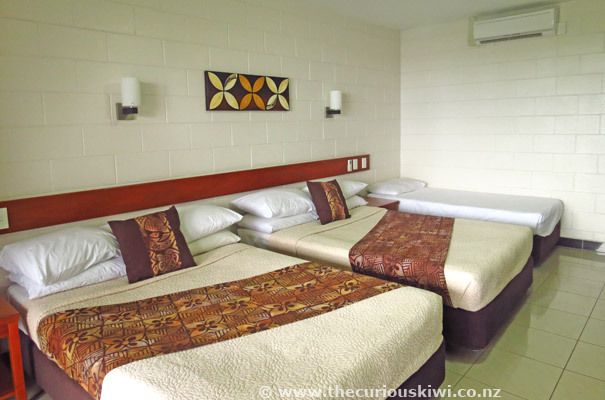 The refurbished Sheraton Samoa Aggie Grey's Hotel & Bungalows opened in April 2016. Adjoining the hotel is a small casino, the casino is only open to those with foreign passports who are residential guests of a hotel. You need to take your passport on your first visit, you will then be issued with a card that you can use for subsequent visits. If you're not keen on gambling but your travel companions are, there is a really nice lobby bar and cafe in Aggie Grey's Hotel where you could wait. (Minimum $10 tala bet on the tables). 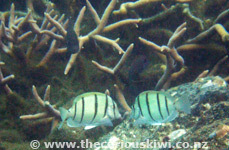 AquaSamoa run dive and snorkel trips from Apia. 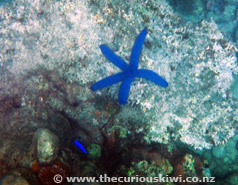 We went out on a two hour guided snorkelling trip that took us over a reef where we saw a lot of small fish and an electric blue star fish. Something we didn't see but the guide did, was a reef shark. 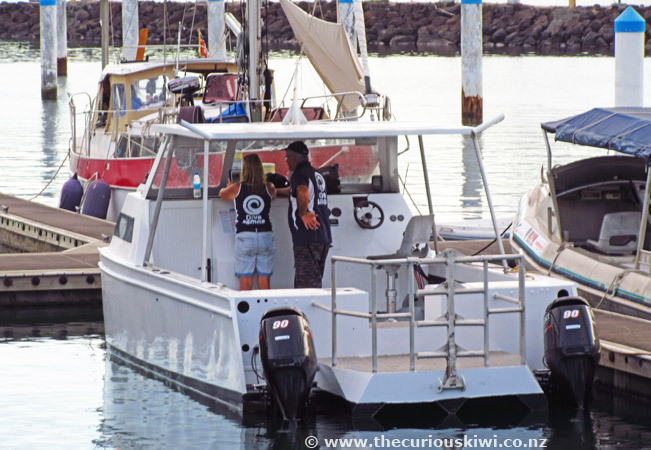 I would have panicked and probably left a brown trail if I saw the shark so I'm pleased I had my head down and fins flapping on the way back to the boat when it was spotted. 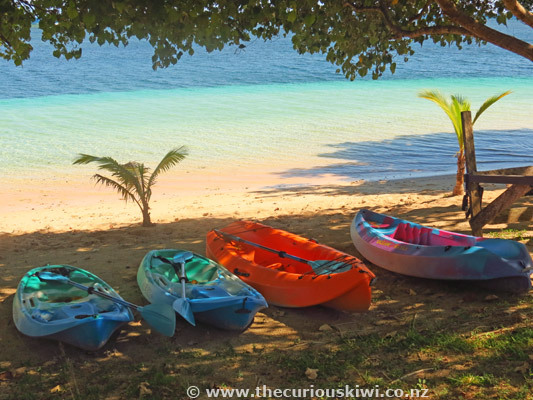 Snorkel trips cost $80 tala each, AquaSamoa have snorkel gear or you can take your own. The guide was good, there had been some wind and rain so the water wasn't as clear as it might be on other days, the water is lovely and warm though - no wet suit required. We've looked for the Papase'ea Sliding Rocks on previous trips to Samoa and haven't been able to find them, this time with the help of Google maps we got there. You're only going to be sliding down the rocks if there is enough water, we visited at the end of October and the caretakers said the water level was too low (May - November is the dry season so water levels may be too low over these months). 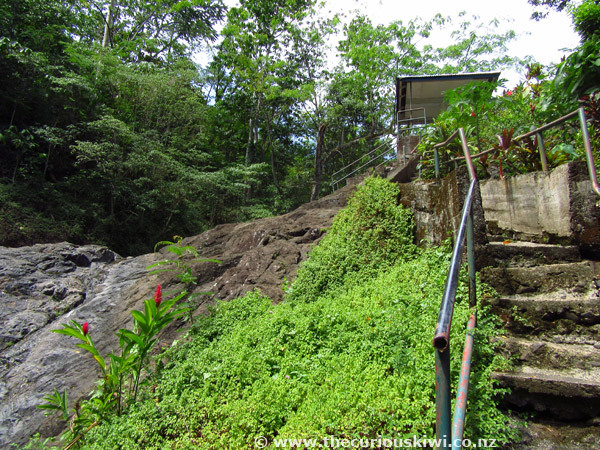 We climbed down 165 or so concrete steps to have a look, there are three rock slides (take some bravery down with you), and a small covered area where spectators can sit. 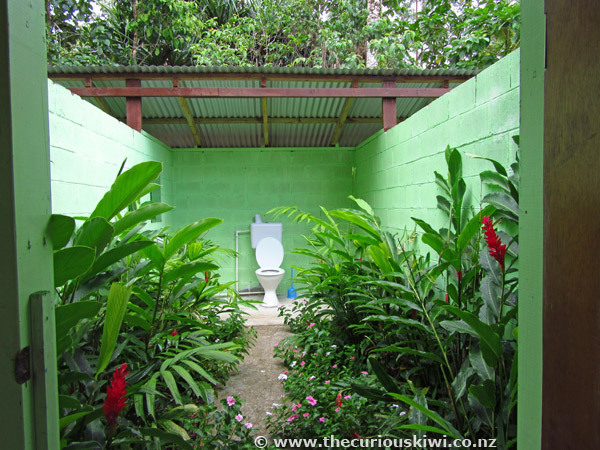 Up at the entrance there is a well kept garden with some fales for shade, as well as toilets. Entrance to the rocks is $5 tala per person, children $2 tala (under 12 years). Open Monday - Saturday 8am - 5.30pm and Sunday 11am - 6pm. Digicel has a kiosk at the airport, if you load $20 tala or more on a SIM card, the SIM card is free. $19 tala gets 675MB for 7 days. 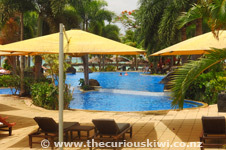 Internet access is expensive at resorts so buying your own SIM card is a good idea. Bluesky is the other provider. 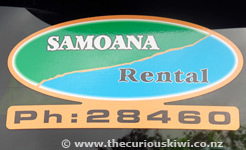 In 2016 we booked a rental car in advance by emailing Samoana Rental. A NZ$300 deposit was required on booking, the rate was $100 tala per day with an additional $15 tala per day for insurance. 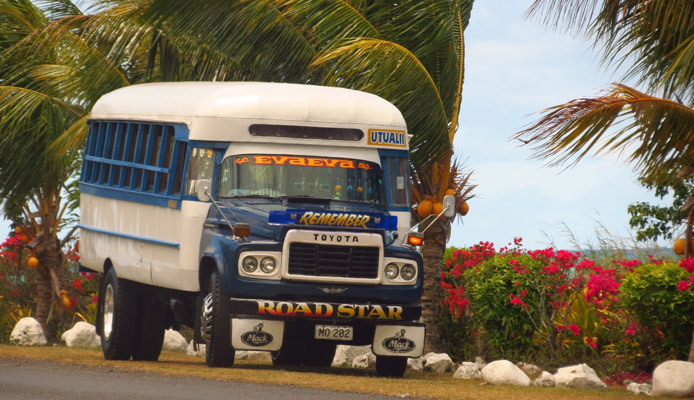 Samoana provide free delivery and pick up to/from hotels in Apia and can issue a temporary drivers license for $21 tala per driver. 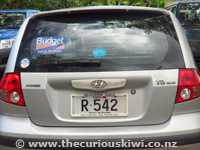 We can't give Samoana Rental a rave review for a couple of reasons - we booked a Suzuki SX4 but were delivered a Toyota IST with a few scratches and dings, only a third of a tank of petrol, and not nearly enough power to get us up Cross Island Road. We also had to call them and remind them to pick up the car after waiting a while in the hotel reception. Tip: A tip we will follow next time is to ask for the year of the vehicle so we know exactly what we're booking and paying for. 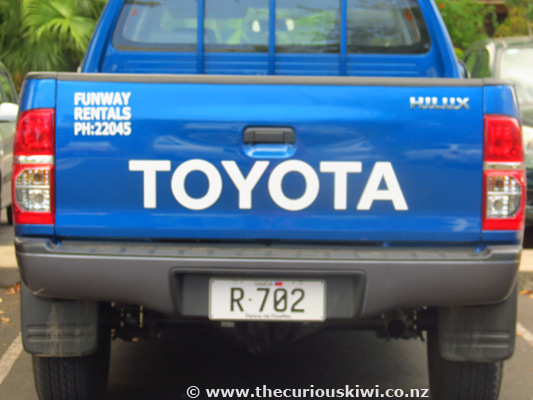 Other rental car options: Funway Rentals, Blue Pacific, Budget, and Discovery Rentals, some accommodation providers may also rent cars. Driver's License - In 2016 Samoana Rental issued a temporary license ($21 tala per driver) when they dropped off the rental car which was convenient. On a previous trip we went to the Post Office to get a license - show your current license and get a one day to one month license for around $20 tala. 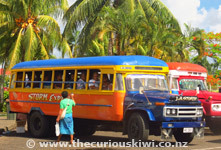 Buses - The big, bright buses are the cheapest way to travel in Samoa. I've read that bus drivers can knock off early in the afternoon so you might want to keep that in mind. 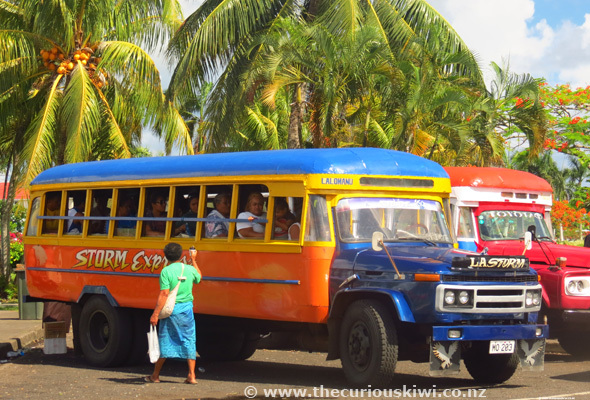 We used the buses in 2009 to get to the wharf to catch the Savaii ferry and to get to Manase Beach in Savaii, if you're travelling on a tight budget bus travel is the way to go. 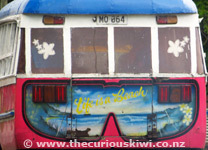 The destination is on the front of the bus, tightly packed is how they roll, pay the fare as you leave. 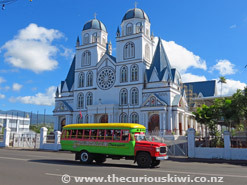 Taxis - You don't have to walk far in Apia to find a taxi as the drivers are always toot tooting their horns at tourists. There are no meters so just agree on the price before you drive away, fares are very reasonable. 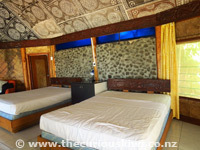 A taxi from the airport to Apia should be 60-70 tala. 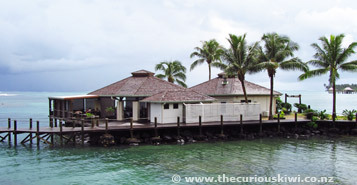 AquaSamoa is near the marina and next door to Paddles Restaurant. You'll see scooters out front for hire from $59 tala a day. (Be aware that Samoa is not as scooter friendly as Rarotonga - the main island Upolu is much bigger than Rarotonga, Apia town centre is busy with traffic, and while Rarotonga is flat, Upolu has hills, especially through the middle of the island (Cross Island Road)). 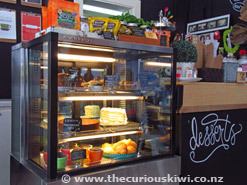 From thecuriouskiwi/blog - Nourish Cafe, Pacific Jewell Garden Cafe, Forest Cafe and Le Petit Cafe. Bistro Tatau has polished wooden floors and attentive bare foot wait staff hidden behind its tinted windows in downtown Apia. 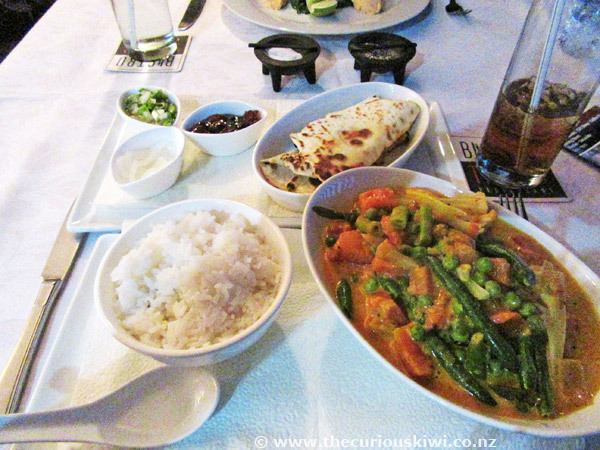 Prices are at the more expensive end for food and drink, however the serving size of my tomato and papaya curry ($50 tala) was large and it was all I could manage, so it was an economical meal. 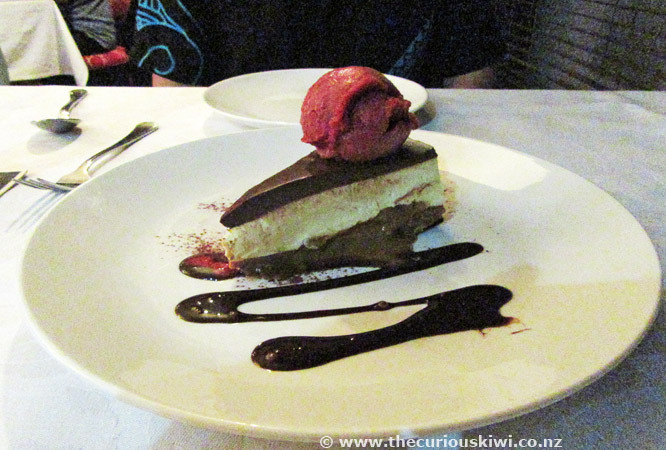 Mike was able to fit in triple chocolate peanut caramel cheesecake ($28) for dessert, we'd happily dine at Bistro Tatau again. Open for lunch Monday - Friday from 12 noon - 2pm, and dinner Monday - Saturday from 6.30pm. Memories of good food and service led us back to Paddles in 2016. The staff are still super nice and this year when we pulled up in the rain someone came across the road with an umbrella - how's that for superior service. 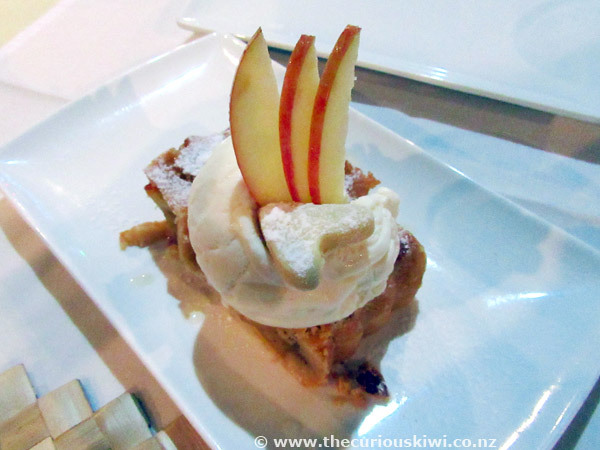 The servings at Paddles are large so this time I bypassed the Papaya Flyer smoothie to leave room for dessert - apple pie ($25 tala). 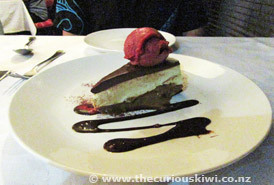 The main menu is substantial with risotto, beef and chicken dishes, pasta and seafood - mains from $35 tala. 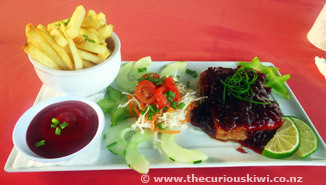 We still highly recommend Paddles and would also suggest making a reservation as it's popular. Open Monday - Saturday from 5pm (Paddles on Instagram). 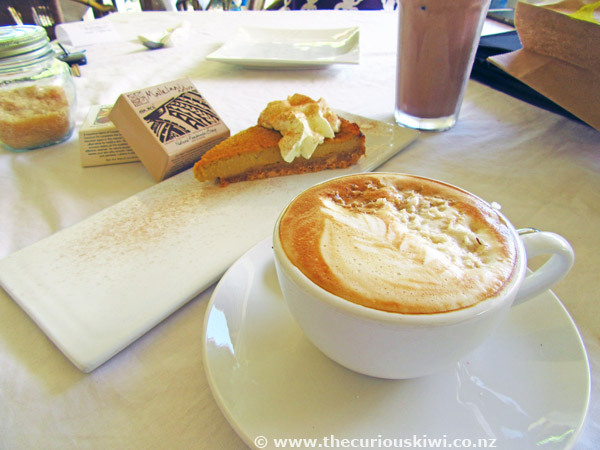 Milani Caffe on Convent Street in downtown Apia is owned by the same family that run Paddles and offers the same level of service. 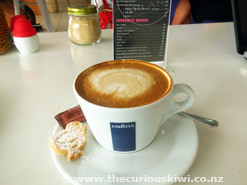 Milani is a modern, air conditioned cafe serving espresso coffee and cake. On the breakfast menu are dishes like eggs benedict ($25), old fashioned oat meal ($15), and the full English ($32). Lunch includes Thai green chicken curry ($27), seafood risotto ($32), and a BLT ($25). 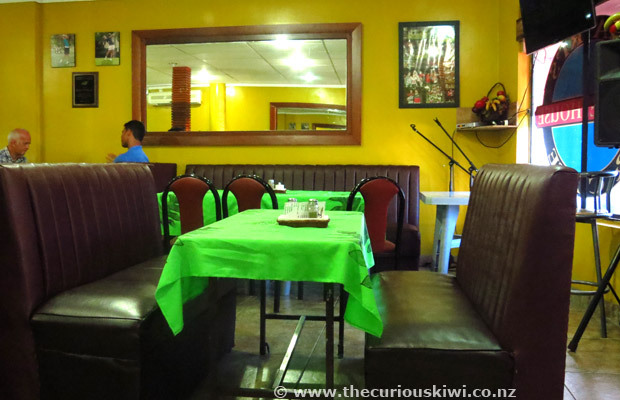 Milani is a good spot to read the local paper, and you can sit in the seat of a rugby star (BTW Richie sat here (Richie McCaw that is)). Cheap and substantial cafe fare may still be on the menu at Mari's. The cafe is hidden behind tinted windows near Sheraton Samoa Aggie Grey's Hotel & Bungalows on Beach Road. We didn't make it back to Mari's in 2016 but it's still popular with locals, people rate the rest rooms, and Mike reckons he'll be back one day for another 'Steak Bomb'. 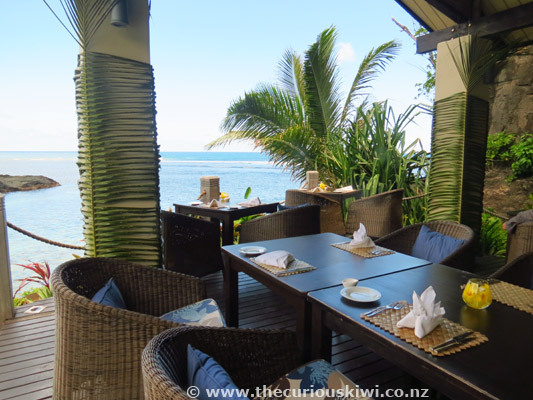 We stayed at Tanoa Tusitala Hotel again in 2016 and Amanaki Restaurant & Bar is a short walk away. 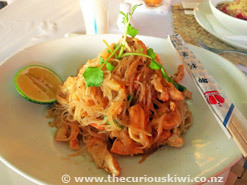 Amanaki was once again our go-to place for good value meals. The bar and restaurant are light and airy, and the staff are friendly. 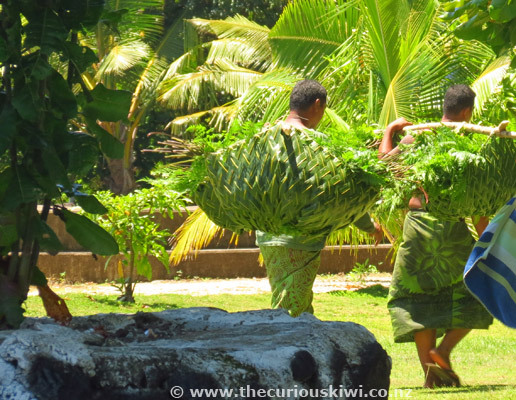 Hot days are standard issue in Samoa and a chilled niu (coconut) from the fridge or a glass of local beer go down well at the end of a day of sightseeing, and at $5 tala each they won't break the bank. The food menu and prices were the same as when we dined in 2014 - a sample of the menu - fish burgers ($18 tala), chicken fettuccine ($25 tala) and crumbed beef schnitzel ($20 tala). 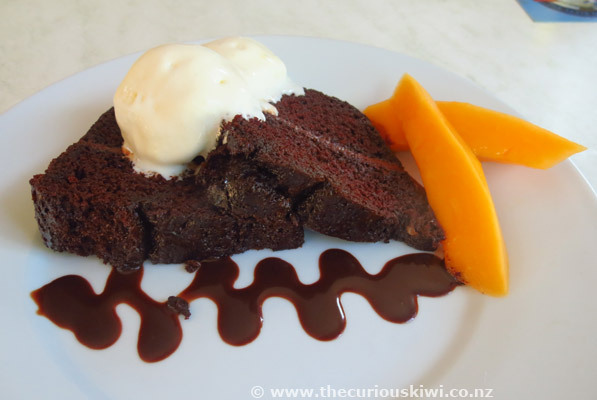 We now recommend the chocolate cake ($14 tala) and the banana fritters ($12 tala) on the small dessert menu. Mocktails and cocktails are priced from $10 - $18 tala, and Friday is happy hour from 5pm-7pm. Open 7 days, note the restaurant and bar are closed on Sunday for lunch but open in the evening for dinner. 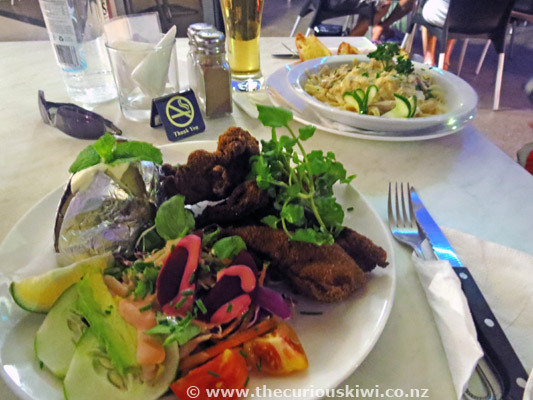 So little time, so much food - we didn't get to Giordano's in 2016 but it is memorable because of the lovely decor and atmosphere, and it is still rated highly by reviewers. Giordano's is a good option on Sunday evening when many other dining options are closed. Open Tuesday - Sunday. 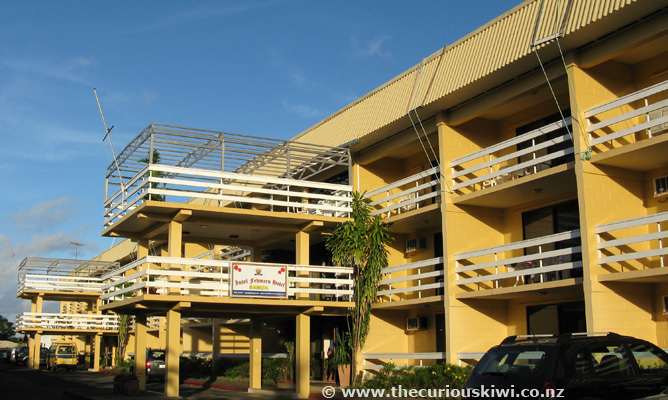 Tip: If you are staying at the Insel Fehmarn Hotel, Giordano's is across the road, if you're at the Samoan Outrigger, it's a short walk away. 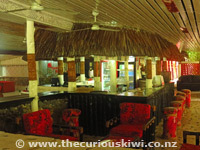 Apia Yacht Club is a casual and popular venue for especially well priced drinks. There's an outdoor deck on the water ideal for drinking in the sunset. We returned to the Yacht Club for cocktails and they are still only $8 tala, beer $5. The Yacht Club is a cheap taxi ride down the waterfront. Closed Sunday and Monday. 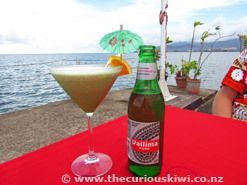 Vailima is a popular and easy drinking brand of local beer, Vailima Natural is unusual in that it is brewed using breadfruit. If you're on a mission to sample award winning beers, Vailima Pure won a bronze medal at the 2013 Australian International Beer Awards (Vailima is owned by Coca-Cola Amatil). 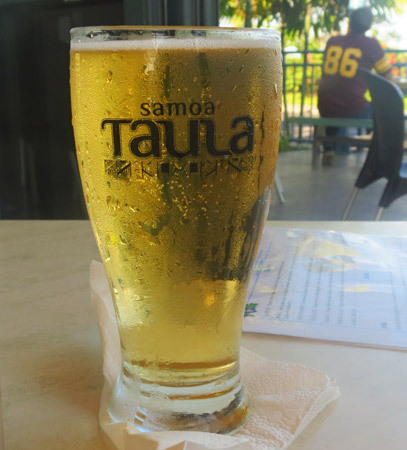 Taula Beverage Company (formerly Samoa Beverage Company) is Samoan owned and brews include Samoa Taula and Pure Sama. 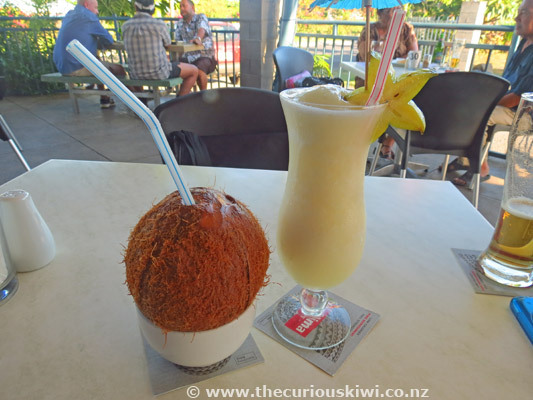 My favourite drink is chilled coconut (niu) water, if you've had coconut water at room temperature and didn't like it, try it straight from the fridge, you might be pleasantly surprised. If you see Koko Samoa on a menu, it's Samoa's version of hot chocolate, well worth trying. Hiring a car is the easiest way to do an Upolu Island Road Trip (see Getting Around above). If you're staying in Apia and want to drive around the whole island of Upolu we'd recommend you do it over two days to allow time for stops and detours. Cross Island Road does what it says and crosses the island so it makes it convenient to drive the east coast one day, and the west coast another. 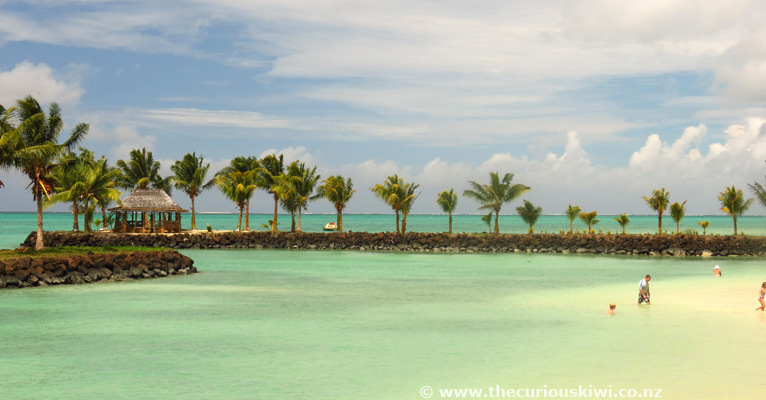 If you don't have two days to spare and are wondering which side of the island to choose, we recommend the east coast. 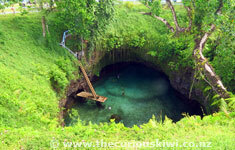 The south east coast of Upolu is home to the stunning and not to be missed To Sua Ocean Trench. 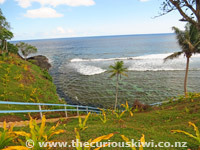 Below is some of what you will see driving around the east coast of Upolu. 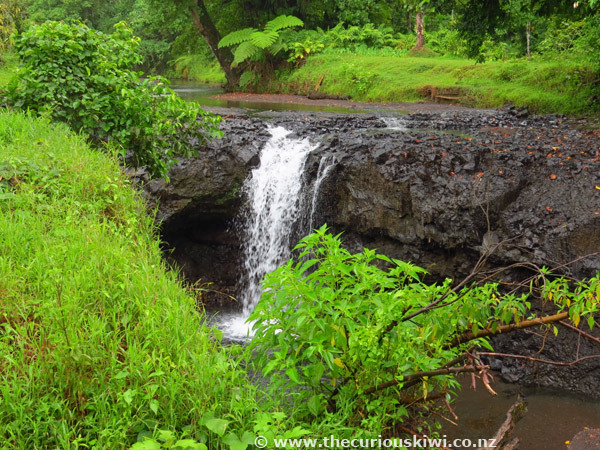 (To give you an idea of distance, we started in Apia, drove down the east coast to Piula Cave Pool, continued to the south east coast to Lalomanu, and To Sua Trench, then drove until we met Cross Island Road and headed back to Apia (around 150kms in total). The speed limit is 56 km/h outside Apia and it pays to keep an eye out for wandering dogs, free range chickens and pigs). 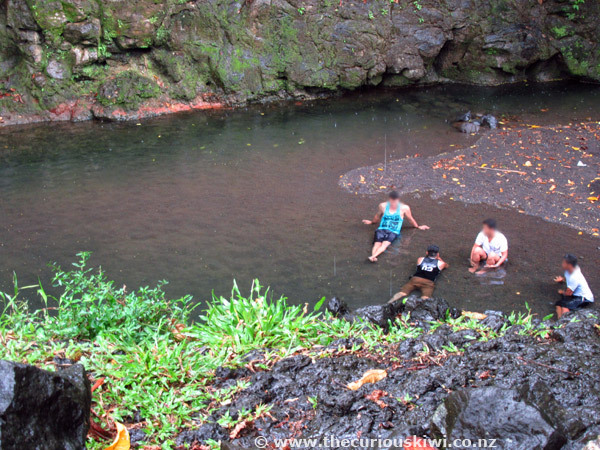 Piula Cave Pool is located under the Theological College in the village of Lufilufi on the east coast of Upolu, around 45 minutes drive from Apia. 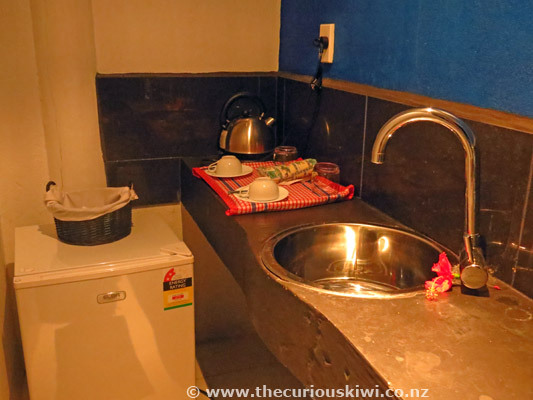 It's a well tended and popular spot with good toilet and changing facilities. 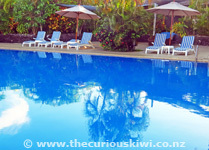 It costs $5 tala to cool off in the fresh water pool and swim with the fish, it's a family friendly place for a dip. Take snorkel gear if you have it. Closed Sunday. 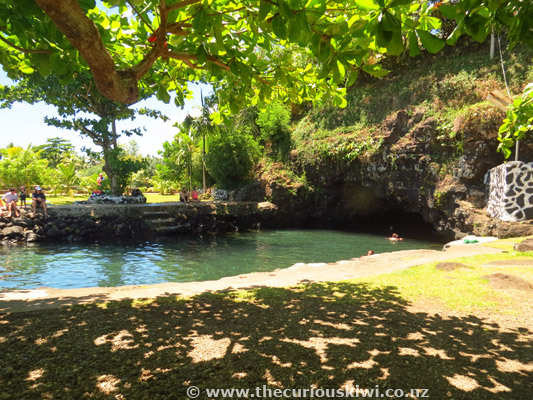 To Sua Ocean Trench on the south east coast in Lotofaga is the sort of place dreams are made of and it was one of the highlights of our trip to Samoa. If you have seen photos of the trench/swimming hole, rest assured that it's likely it will look even more amazing in person. 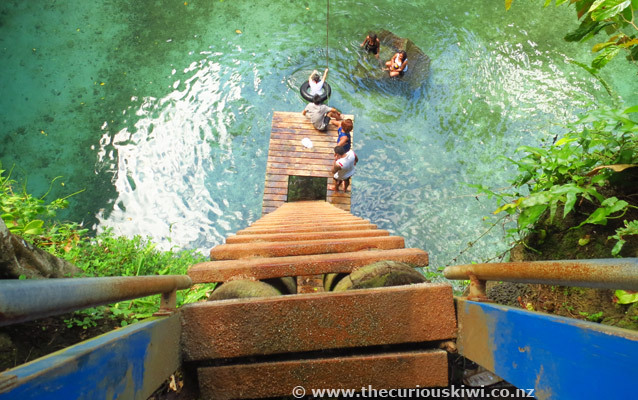 I'd been psyching myself up since we left Rotorua to make the climb down the steep ladder. It was touch and go for a while whether I'd get all the way down, but I did, and the swim at the end was so worth it. Be brave. Although the ladder is steep, it's very sturdy. There's not a lot of space* to leave belongings inside the trench so leave anything valuable in a locked vehicle. 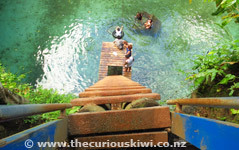 It's believed the trench was formed due to the collapse of a roof in a lava tube system, the collapse has created a magical place for a dip. 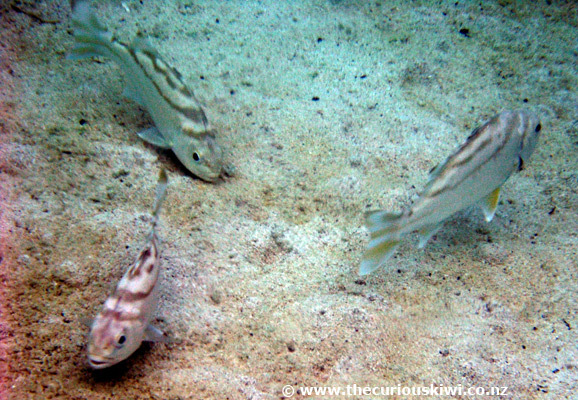 It's easy to forget that the trench is connected to the sea, but strong currents can flow through. There's a rope stretched across the trench and it gives you something to grab hold of if you feel currents moving you around too much. We didn't take our snorkel gear down but wished we had. (*There are open fales in the garden where you can leave beach bags etc). It's not just the trench that's worth a visit, surrounding the trench is a well kept garden dotted with open fales ideal for a picnic in the shade. 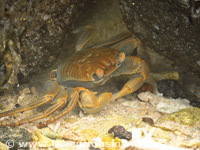 There is also a walkway down to rock pools by the sea, and if you visit at high tide, blow holes should be in action. The entry cost was $20 tala each, there are good toilet facilities and an outdoor shower for a rinse. Note: If you don't want to swim in the trench you will still need to pay $20 tala. 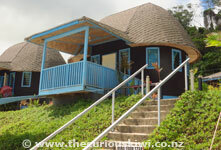 Sea Breeze Resort is in Aufaga (Paradise Cove), around 5kms from To Sua Trench in the direction of Lalomanu. 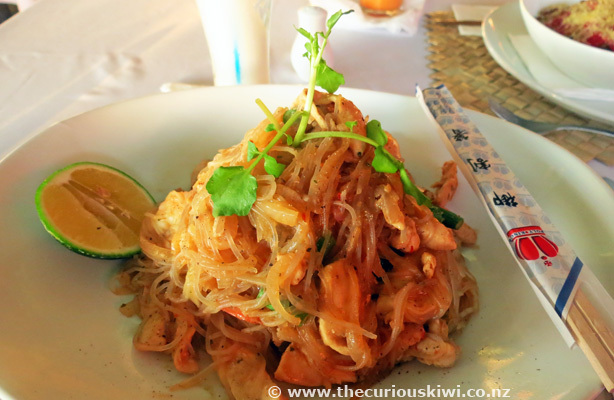 We had lunch virtually on the water at light and breezy Waterfront Restaurant & Bar. 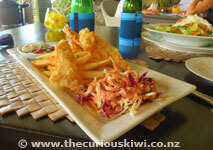 The sea provided a peaceful backdrop for our chicken salad, and fish and chip lunch (lunch from $28 - $75 tala). Sea Breeze looks an idyllic place for a few days of rest and relaxation. 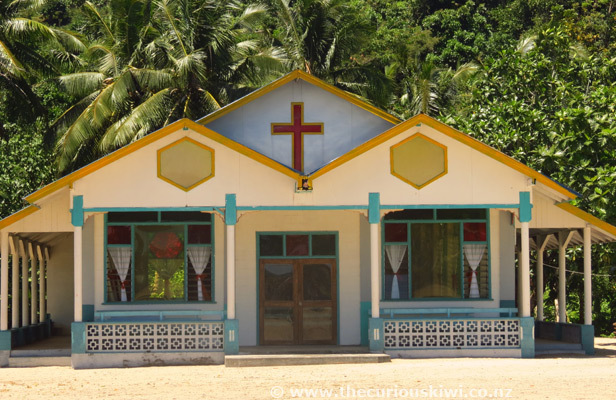 It was our first visit to Lalomanu, an area that was damaged severely by the 2009 tsunami. We went to Litia Sini Beach Resort for a cold drink in the afternoon. 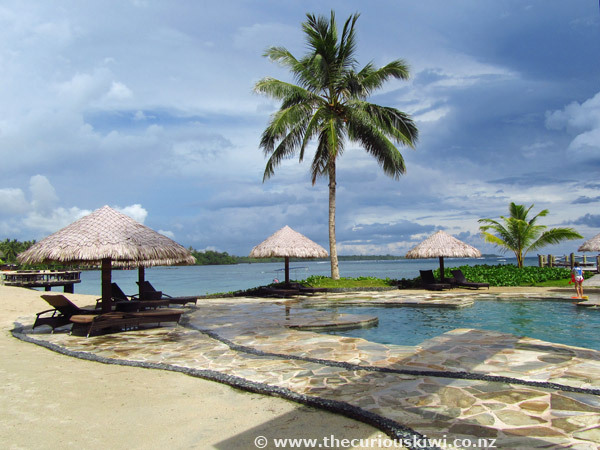 The resort was rebuilt following the tsunami and has a collection of blue trimmed closed fales that look out over the sea. 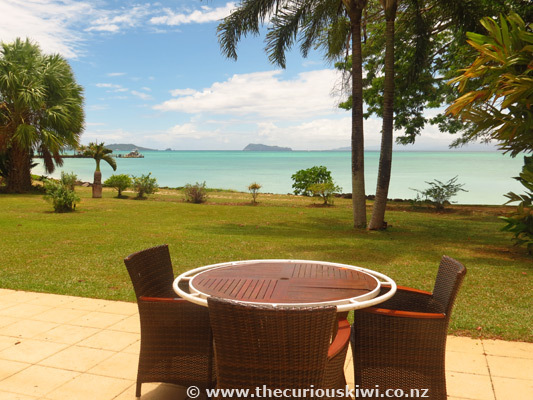 If you're looking for an open fale, Taufua Beach Fales is nearby. 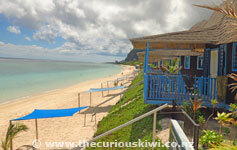 Taufua has both open and closed fales on the beach, and like Litia Sini, was rebuilt following the tsunami. Togitogiga Waterfalls are part of O Le Pupu Pue National Park and entrance to the fresh water pools and small waterfalls is free (look for the roadside sign). 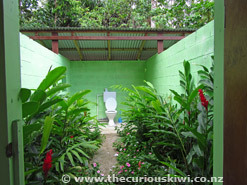 There is a neat open air garden toilet near the Visitor Centre (the VC was closed when we visited). 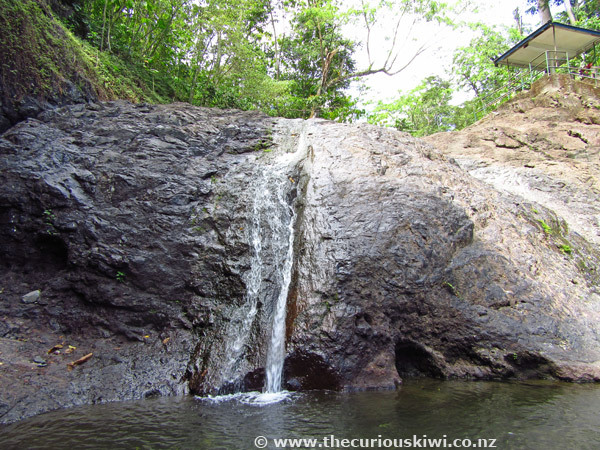 Drive a short distance until you see a sign for the falls and then walk a few minutes down to the fresh water pools and little falls. We had our swim on the walk down to the falls as it was pouring with rain, but a few locals were cooling off. There are a couple of fales for shade or shelter and some old changing sheds. Back at the roadside, there is a track to the Ma Tree. I got half way down the track but turned back as I had jandals on - the track is rocky and has plenty of exposed tree roots so sturdier shoes are needed. Mike walked the required distance but didn't find the tree, it exists though - next time, in better shoes. As mentioned above, Cross Island Road divides Upolu Island. 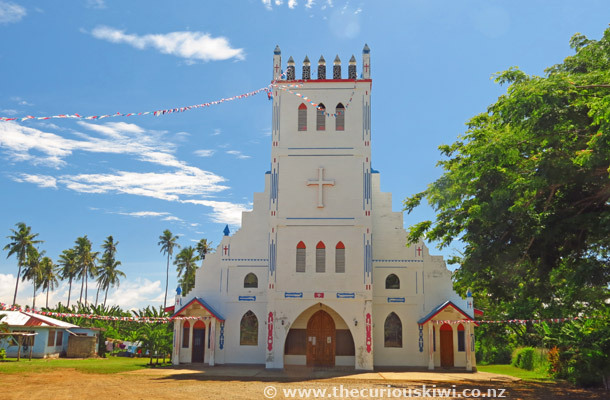 If you're on the south east or south west coast and you want to take Cross Island Road to Apia, the turn off is in the village of Siumu. 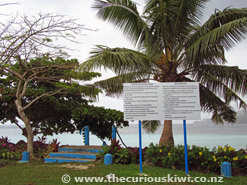 You may also see a sign for Lupe Sina Treesort which is on Cross Island Road. Cross Island Road can be a destination in itself as there are a few attractions down the road. 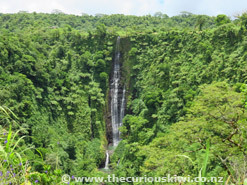 I'm starting from the northern end in Apia as that end has the most to see, and ending at Papapapaitai Falls at the southern end. 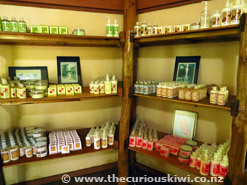 Mailelani Samoa make body care products and soap from local ingredients. In the same building as the Mailelani shop is Le Petit Cafe specialising in crepes and waffles. We sat on the verandah with a slice of pumpkin pie, a coconut creme latte, and an iced chocolate, happy days. Well worth the trip, the driveway down to Mailelani is a bit narrow for two cars so just take it slow if you meet oncoming traffic. 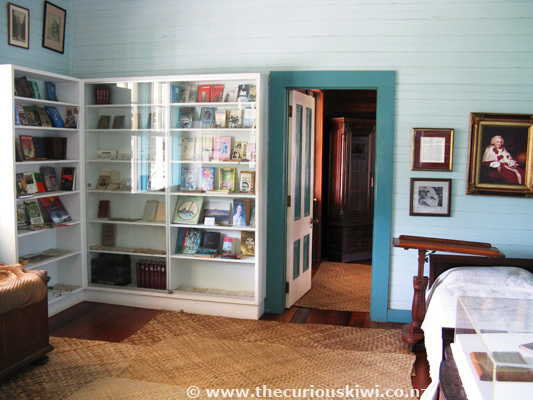 The museum is the restored former residence of Robert Louis Stevenson (1850-1894), a Scottish author who spent the last four years of his life living in Samoa with his family. 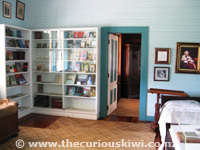 Although Robert Louis only spent four years in Samoa before his death, he wrote quite a few novels during that time, and became known as a kind and generous man as well as employer. 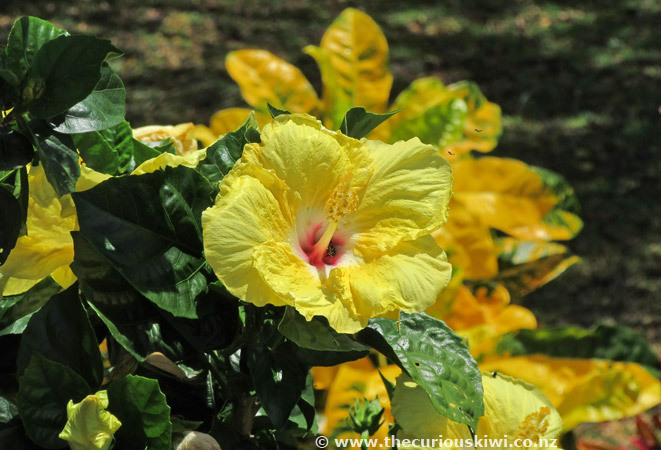 He was much loved by the Samoan people and given the name Tusitala (teller of tales). 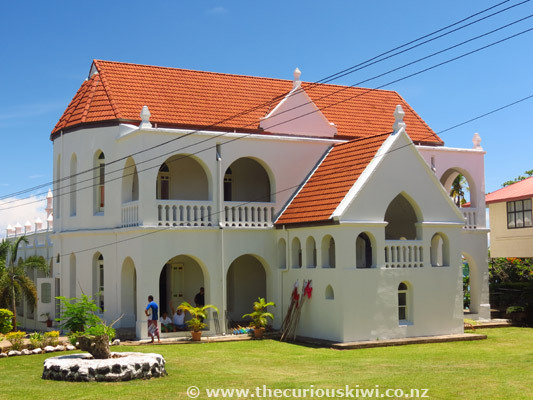 We thought the guided tour was worth doing, and Vailima is a lovely property. Robert Louis Stevenson is buried nearby on top of Mount Vaea. 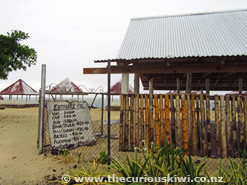 Robert's wife Fanny died in America in 1914, her ashes were returned to Samoa to rest with her husband. 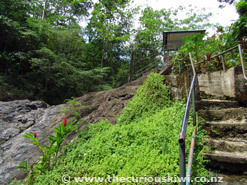 You can climb to the top of Mount Vaea but wear sturdy footwear and be prepared for a hot, and possibly slippery climb. Museum admission $20 tala adults. Closed Sunday. 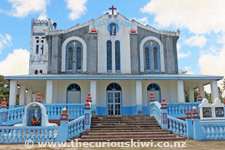 The Baha'i Temple or Baha'i House of Worship in Samoa is one of only a few Baha'i Temples in the world. If you want to learn about the Baha'i faith it's obviously a good place to visit, and the temple is set in some nice gardens, however I wouldn't put it on the 'must visit' list. 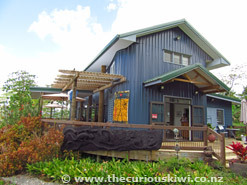 Pottery, Samoan wood combs and paintings are some of the art work displayed in the modern gallery. 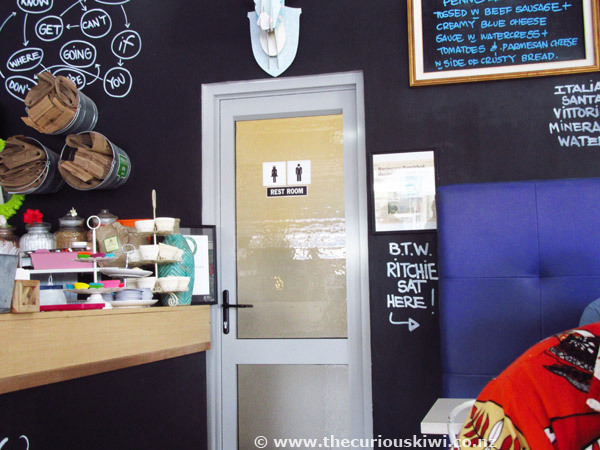 Adult Workshops may be an option on a Saturday, and there is also a cafe (that we didn't visit). Back at my computer in Rotorua I see there is treehouse accommodation onsite as well, I would have loved to see that. Open Tuesday - Sunday. 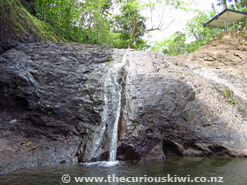 Papapapaitai Falls are absolutely beautiful to look at, especially after heavy rain, but you can only see them from a distance. There is a parking / viewing area on the side of the road, there is a sign but it's easy to miss so keep your eyes peeled. 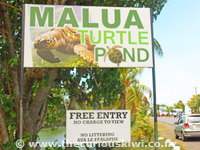 Malua Turtle Pond is about 40 minutes drive west of Apia on the road to Faleolo International Airport. 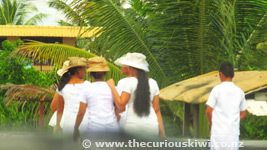 We happened to arrive at the pond at the same time as a family doing an island tour in a taxi. The taxi driver had some papaya/paw paw which encouraged the turtles to make an appearance, I'm not sure whether we would have seen them otherwise. It's free to visit the turtle pond and there is a sign for it, but it's easy to miss. If you see plastic bags lying around do pick them up and take them away. (We revisited the turtle pond in 2016, without any fruit there wasn't a turtle shell to be seen). 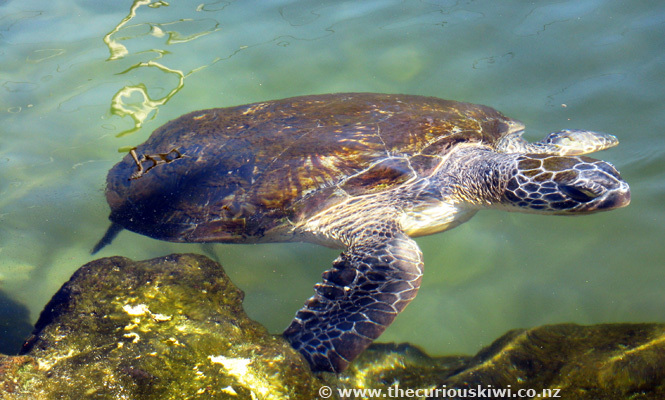 Tip: If you're staying in Apia and don't have a rental car, you could combine a visit to the turtle pond with a taxi to the airport (if you've got a day time departure). 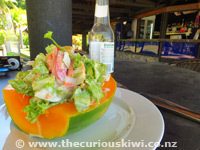 The pond is on the side of the road so it's a quick and easy detour to make, just make sure you've got some papaya with you. There are a series of intricate carvings that lead you to the entrance of the EFKS Museum which I read is more art gallery than museum, it certainly looked like it from what I could see in the windows (it's closed Saturday and Sunday). Entrance fee is $10 tala, add $20 tala if you want to take photos. Open Monday - Friday 8.30am - 4.30pm. (An enterprising chap snoozing in a fale nearby wanted an entrance fee from me when he saw me taking photos of flowers in the garden, given the museum was closed I wasn't paying up). 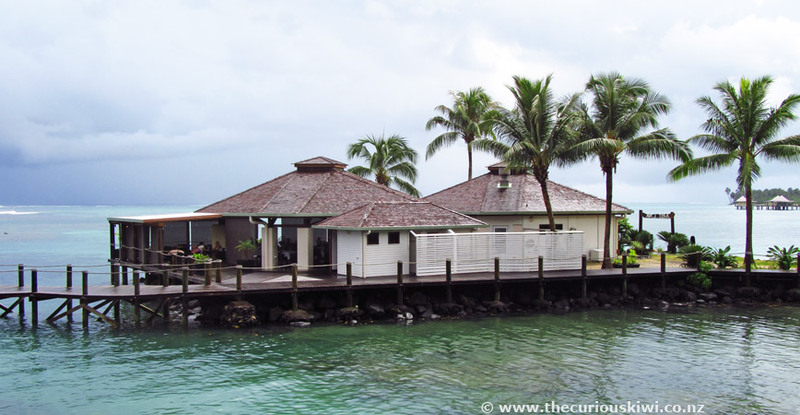 Sheraton Samoa Aggie Grey's Resort in Mulifanua is 3km from the airport and 4km from Mulifanua Wharf for ferries to/from Savaii. 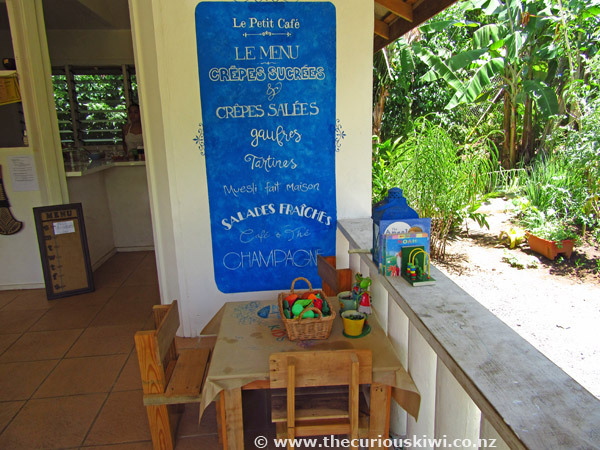 We visited for lunch after driving off the Savaii ferry in 2014. We were quite taken with the beautiful surroundings, but surprised to read via reviews that the resort doesn't live up to the expectations of some of its guests. Note: If you're heading here to play golf check the course is still being used, it looked overgrown when we visited in October 2016. 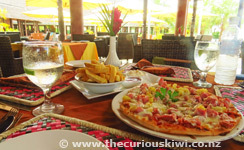 We liked our Hawaiian pizza ($48 tala) and side of fries for lunch. Aggie Grey's on the lagoon looked a picture perfect island resort to us, so maybe we'll stay one day and experience it for ourselves. 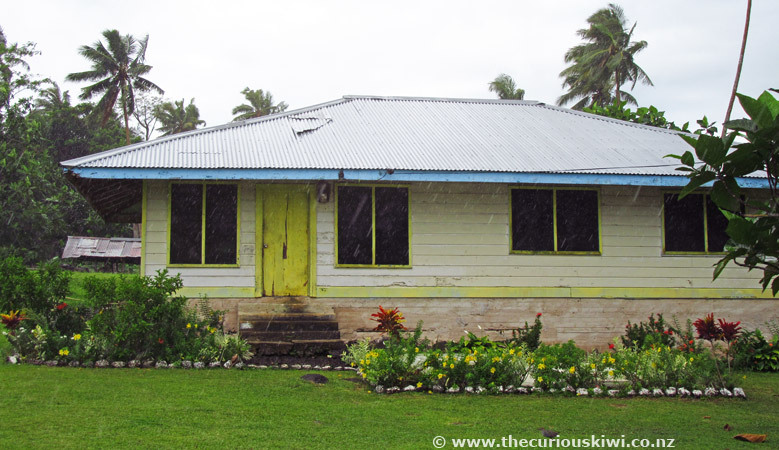 In 2016 we followed the coast road in the pouring rain from Aggie Grey's Resort to the village of Savaia. 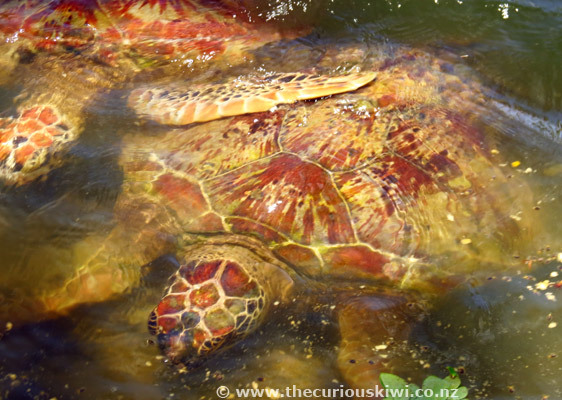 You can swim in the Savaia Marine Protected Area and see giant clams. 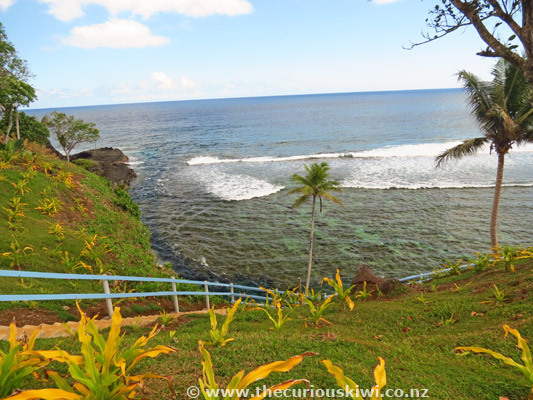 We'd just seen giant clams in Tonga so we didn't go for a swim, but there are stairs down to the sea, and it's a lovely spot. It costs $10 tala per person, and you can swim Monday - Saturday, no swimming is allowed on Sunday. 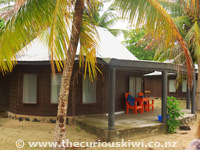 Le Valasi's Beach Fales are nearby and that's where you head to pay, and even stay if you'd like to. From Savaia we drove to Return to Paradise Resort in Lefaga. Heads up - if you want to enter the resort as a day visitor it costs $30 tala each (the $30 tala can be credited to food in the restaurant). If you're at the gate thinking should we? shouldn't we? I'm here to say you're not missing out if you keep the $30 tala each in your pocket. The food was ok but not great, and the service in the restaurant was slow. 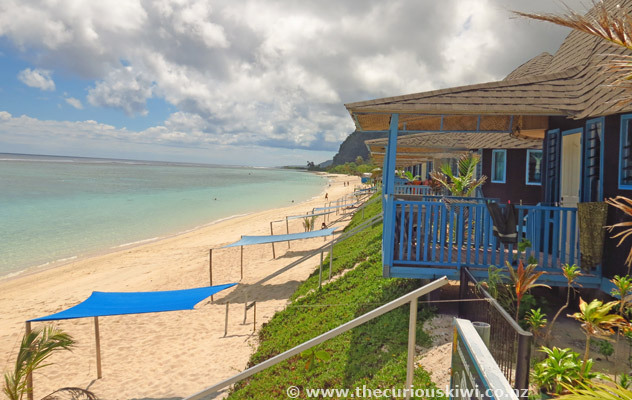 To be fair we didn't see the beach on a good day but you can swim at Savaia (see above), or not far from Return to Paradise Resort look for a collection of open fales on the sand - entry is $10 tala each or $30-$40 tala for a car load. 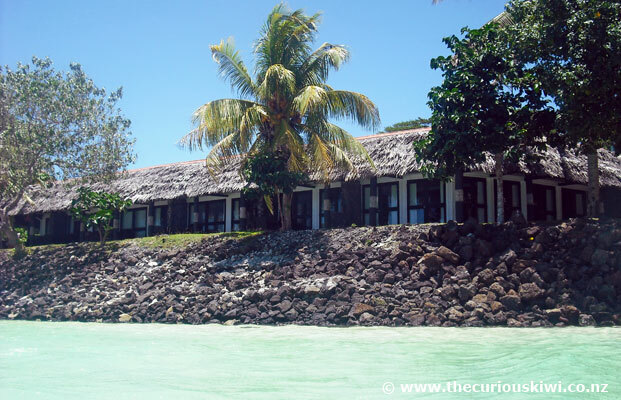 Next stop was Coconuts Beach Club Resort & Spa in Siumu Village with their over water fales. 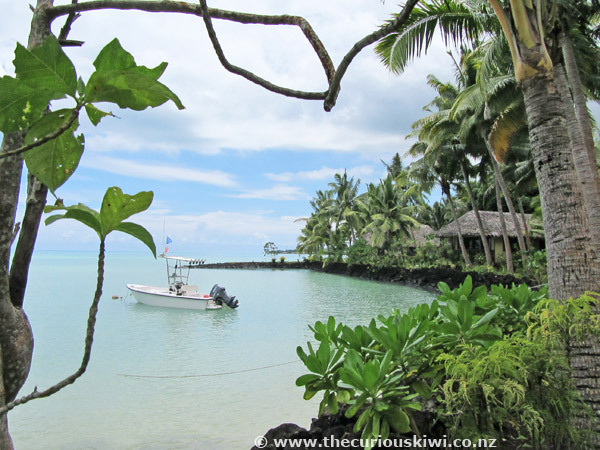 If I was looking for top end accommodation in Samoa I would put Coconuts on the hit list, along with Sinalei Reef Resort & Spa nearby. As we walked into the bar by the pool at Sinalei someone hit an island style gong and I wondered what it meant. 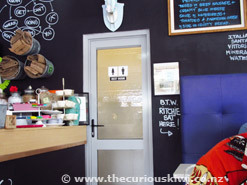 It meant afternoon tea was ready - cream buns and tea, my kind of place. 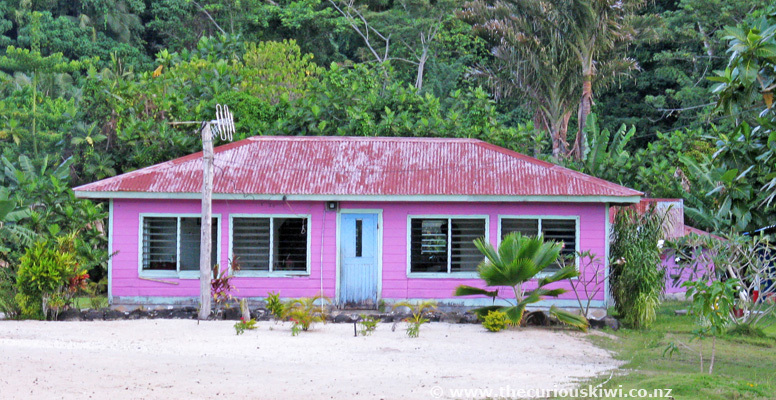 Coconuts and Sinalei are both close to Cross Island Road so if you have a rental car you're only 23km or so away from Apia. 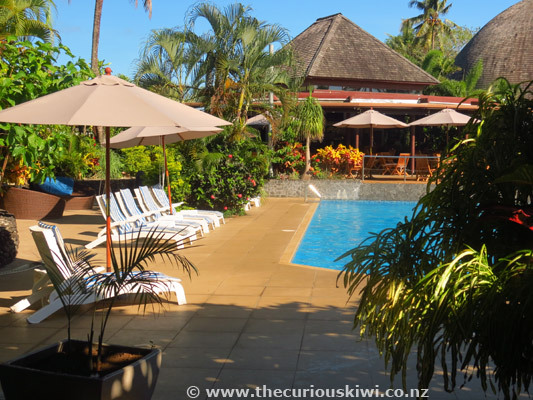 We stayed at Tanoa Tusitala Hotel for the second time in 2016 and once again we found it a good place to stay. The hotel is 4.5 stars and is close to the Savalalo Flea Market and easy walking distance to town. 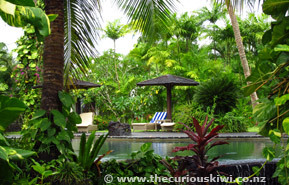 It's set in a large tropical garden and has a good sized swimming pool. 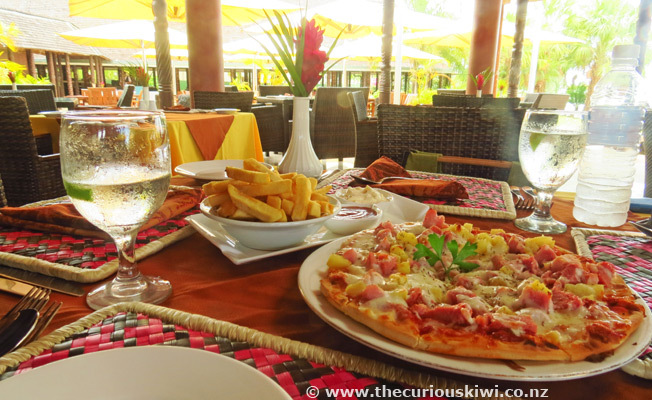 The Deck bar/restaurant is next to the pool and that's where lunch, dinner and drinks are served, there's a separate dining area for buffet breakfast - Tamarind Restaurant. (The onsite shop has gone). For those wanting a workout there is a small fitness centre, and tennis courts. Discovery Rentals has an office onsite for car hire and tour bookings. 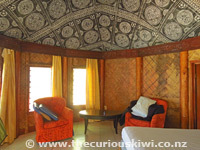 I appreciated that the room photo on the website was exactly the room we checked into - spacious, decorated in island style and equipped with everything we needed (same, same no different in 2016). Hotel staff were lovely and very friendly, I commented on lack of variety at breakfast in 2014, on reflection I was probably being too fussy. (PS. 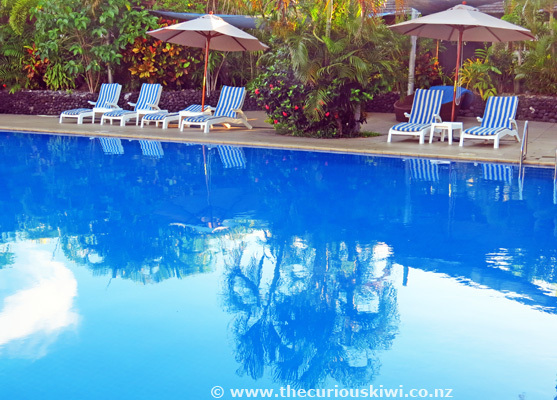 Package deals including Tanoa Tusitala Hotel can be good value - in 2014 our package included return flights from Auckland, airport transfers and 5 nights with breakfast for $999pp; in 2016 we booked the same package but with 2 extra nights for $1057pp (despite the good price we were still miffed with helloworld's $50 booking fee per person). 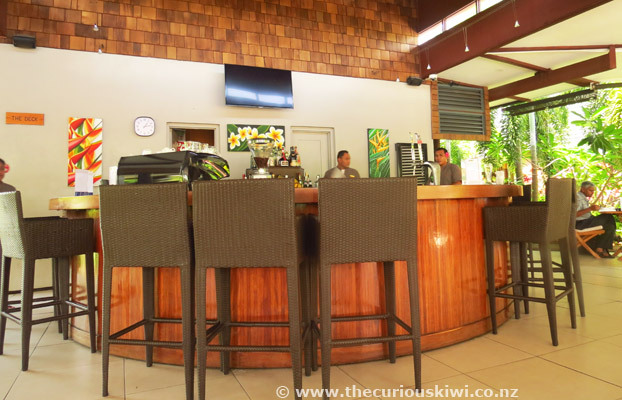 Amanaki Hotel is a few doors up from Tanoa Tusitala, the Amanaki Restaurant/Bar is a popular spot for locals and visitors (see Dining & Drinks above). 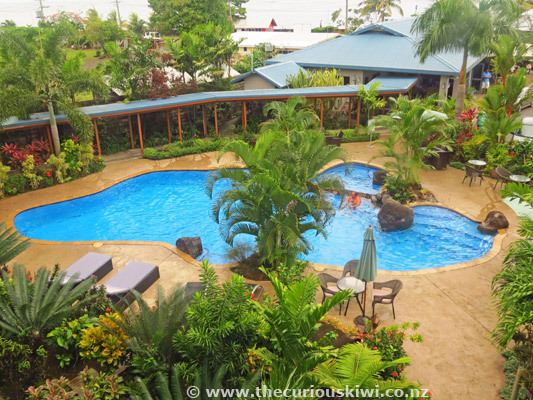 In 2014 we needed two nights accommodation after our stay on Savaii and decided on Amanaki, it was a good choice. We stayed in the top floor of the three level hotel and had views over the swimming pool and Apia harbour. 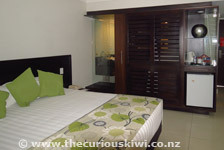 All rooms face the sea and are spacious and air conditioned, furnishings did seem a bit sparse for the room size though. 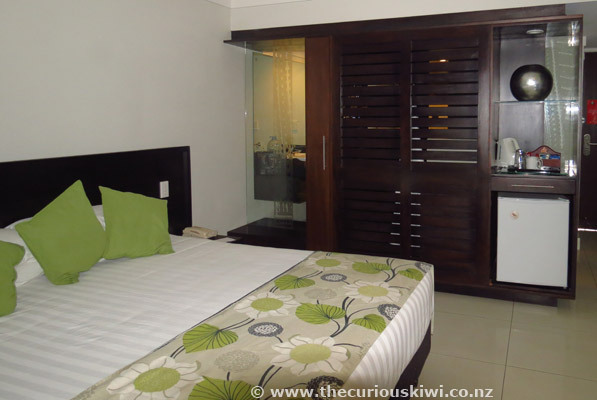 Each room has its own private balcony. A basic continental breakfast is included in the room rate, hot dishes can be ordered as an optional extra. Loved the bunch of bananas hanging in the walkway. 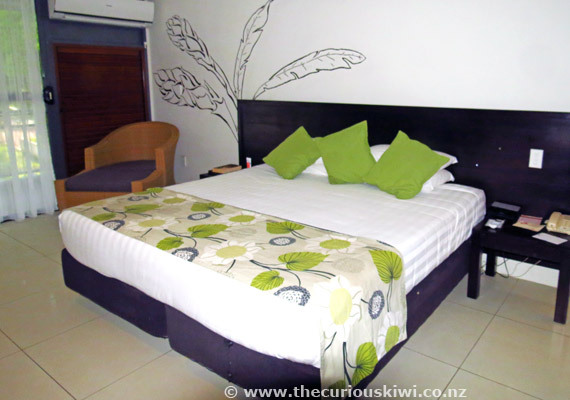 Amanaki Hotel is a good option for those looking for a small, modern hotel that's walking distance to town. 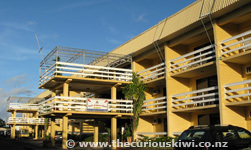 We stayed at Insel Fehmarn Hotel in 2009 and have good memories of the lovely staff we met. Although it's not the flashest hotel in town we really enjoyed our stay. See Trip Advisor for recent hotel reviews. 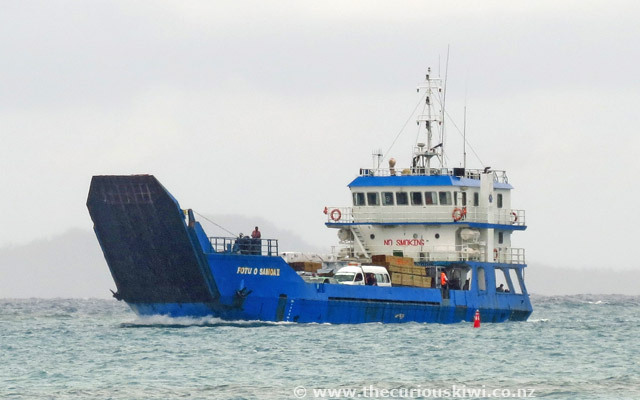 To get there: In 2009 we caught a bus from Apia to Mulifanu ferry terminal to meet the Savaii ferry, if you do this allow plenty of time. 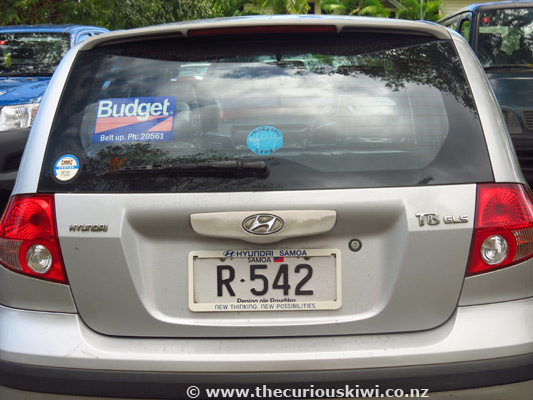 In 2014 we took a rental car on the ferry to Savaii. 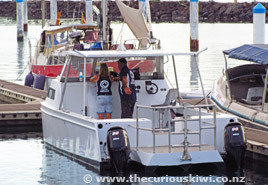 If you're taking a vehicle, pre book your tickets (return preferably) at the Shipping Office next to Paddles Restaurant in Apia to ensure you will get on the boat. The cost was $80 tala each way for the car and driver, other passengers need to get their tickets from the ticket office at the wharf, from $12 tala each way. 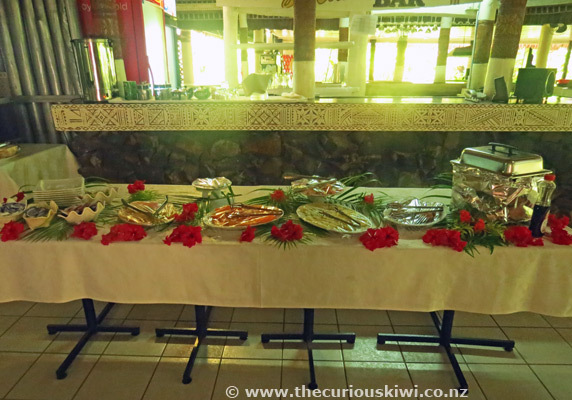 In 2014 we travelled both ways on MV Fotu O Samoa II, this is a small ferry and only has outdoor seating, it can give you a rock 'n' roll ride. The outdoor seating wasn't a problem, but if you're a queasy sea traveller definitely take Sea Legs or something similar. Travelling time was around 90 minutes (newer ferries make the trip quicker). 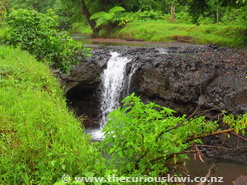 Look out for the Alofaaga Blowholes on the south west coast of Savaii. A note on transport: If you are on a tight budget consider using the public buses and also check whether your chosen accommodation meets guests off the ferry (and if there is a charge). 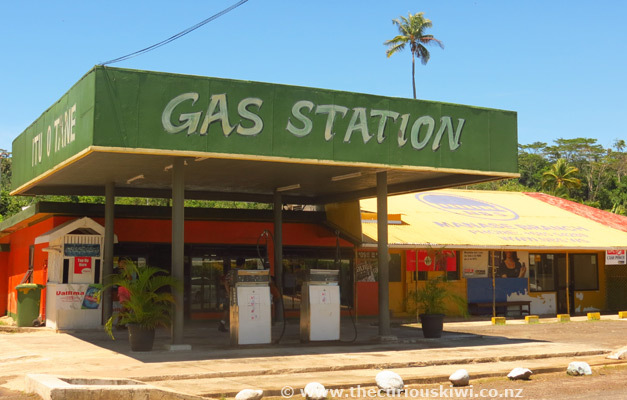 If you get a taxi from central Apia to the ferry, and a taxi to Manase Village for example, and do the same on your return, you will pay upwards of $240 tala plus ferry fare. Doing the same journey by bus will be around $20 tala, plus ferry fare. 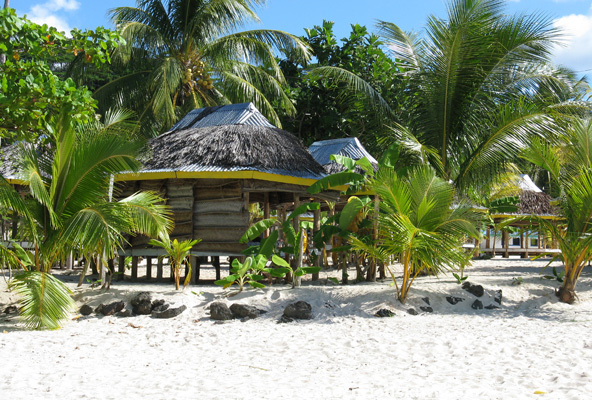 Manase Village is around one hours drive from the wharf in Saleloga. 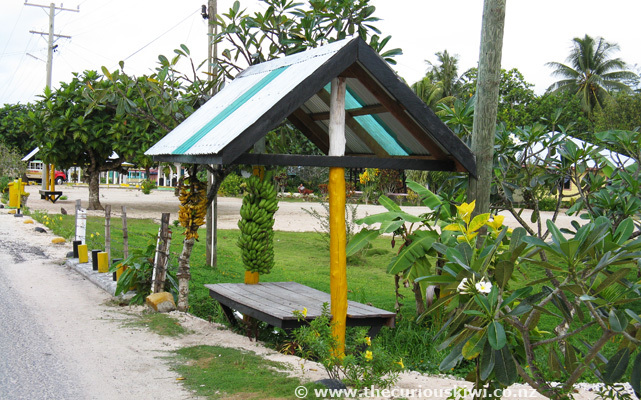 The villagers in Manase really take pride in their patch of paradise and the village is very well kept, we loved the banana bus stops. 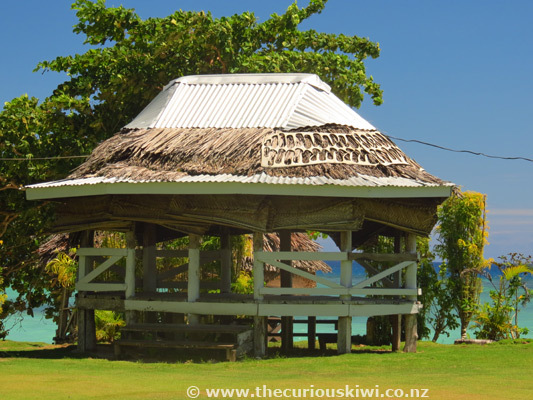 Manase is also a dog free zone and it's no surprise it is known as one of the nicest villages on Savaii. 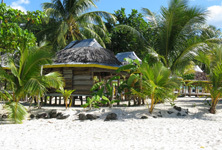 Manase has its own beautiful and deservedly popular stretch of sand where you will find beach fale accommodation options including: Tanu Beach Fales, Jane's Beach Fales, Tailua Beach Fales, Regina's Beach Fales, and Vacations Beach Fales - see Beach Fale Accommodation in Samoa via Samoa Tourism Authority for information. 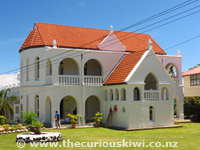 Stevenson's at Manase (Facebook page) is another option, it has beach fale accommodation as well as suites and villas. 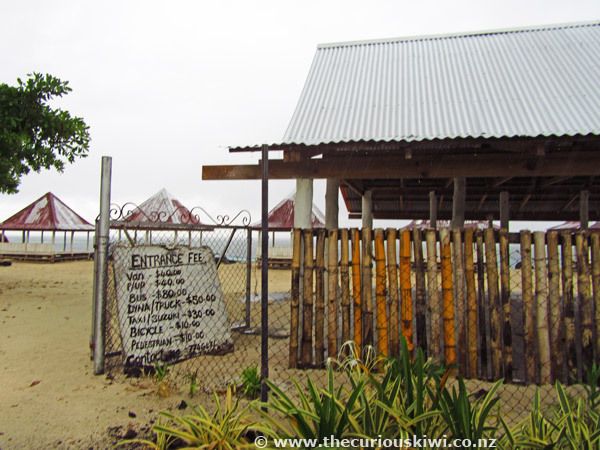 Despite the number of fales in Manase we would not have seen more than a dozen or so visitors during our walks down the beach, this applied once again in October 2014. Personally I would recommend a three night stay minimum in Manase given the time it can take to get there if you're travelling from Apia. If you intend to do an island tour on one of the days I would make it four. 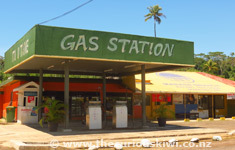 The Gas Station opposite Vacations Beach Fales sells petrol, water, cold drinks, snack foods and sundry grocery items. There is an ANZ ATM machine onsite. The water is clear and warm in Manase and plenty of small fish swim close to the shore, the further out you go over the reef the brighter the fish life becomes. 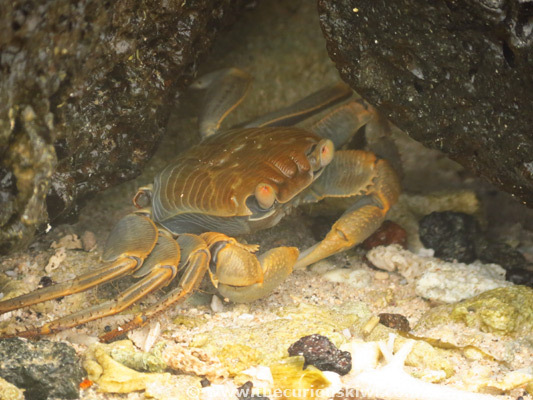 There are some decent sized crabs around and we enjoyed watching them scuttling about on the sand. 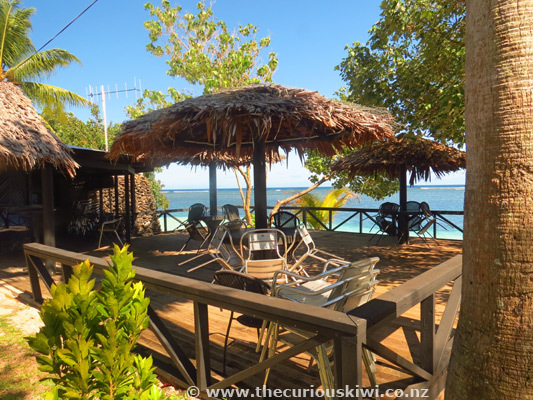 If you're a diver or would like to go out on a snorkelling trip, Dive Savaii is 2 kms down the road in Fagamolo Village, plenty of reviewers mention seeing turtles. The turtle enclosure in Satoalepai is 3 kms from Manase Village. 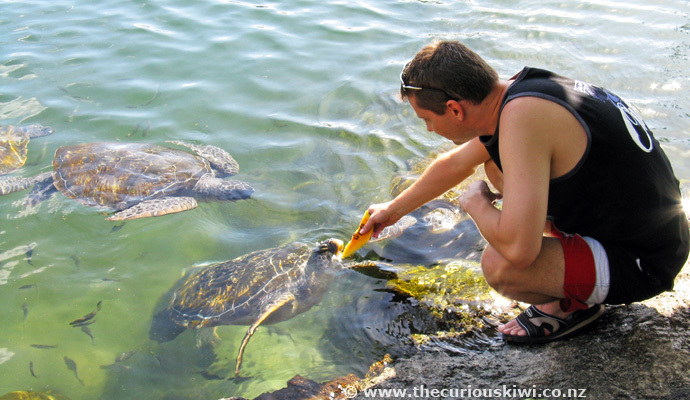 We visited the enclosure in 2009 and you can swim with turtles and feed them papaya. 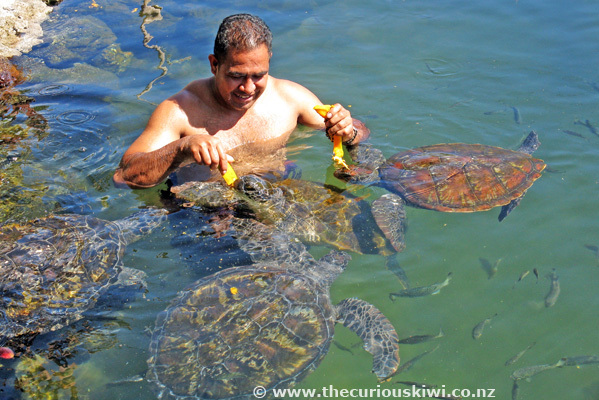 I've read varying descriptions about this operation, Samoa Tourism Authority says '..one of the unique settings that portray a conservation of turtles', Jason's Samoa Visitor Guide says '..it is not a conservation attraction (the turtles are kept in captivity)', and this article says the turtles are raised from infancy by villagers, tagged and released into the wild by the Fisheries Department. 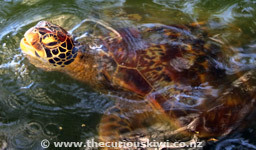 Swimming with Endangered Turtles in Samoa - Protection or Commerce is worth reading, it addresses a lot of the issues around this venture and also points to the possibility of it being successful for all concerned. 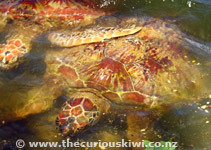 Personally I'd rather see turtles in their natural environment, in 2009 it didn't look the most healthy of environments for the turtles and we chose not to revisit in 2014. 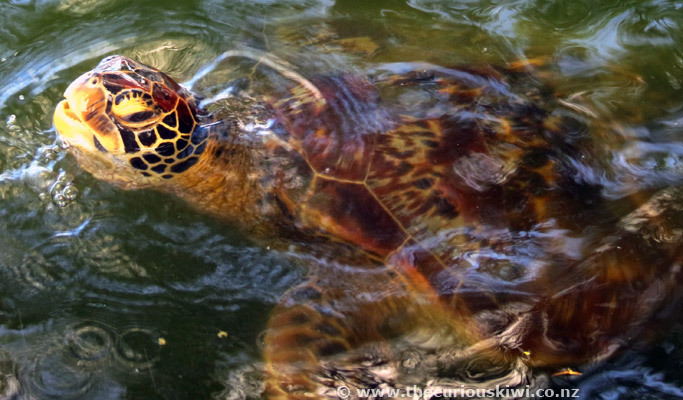 I hope that a person or group with the necessary knowledge is monitoring the welfare of the turtles. 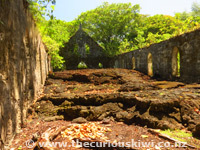 Saleaula Lava Ruins are two kilometres from Satoalepai Village. 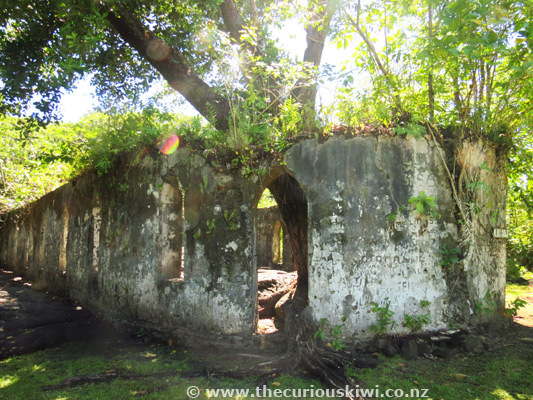 You will see the remains of the lava ruined London Missionary Society Church. 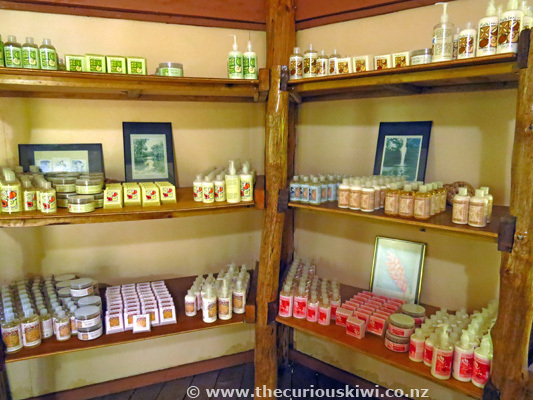 At the entrance there is an Information Fale where you can read about the Mt Matavanu Eruption that began in 1905 and continued until 1911. 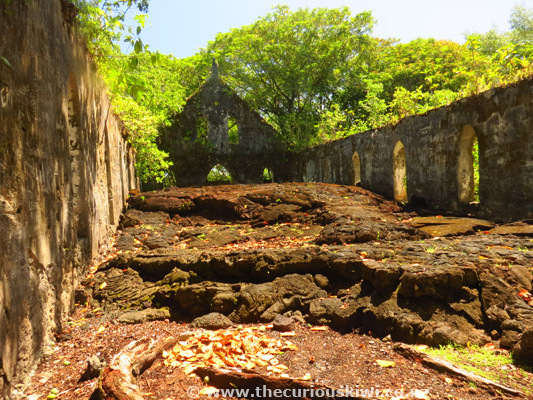 The site is looked after by the Saleaula Womens Committee and one of them took us on a short walk to see the lava ruined church, and the virgin's grave which lava oddly veered around on its march to the coast. 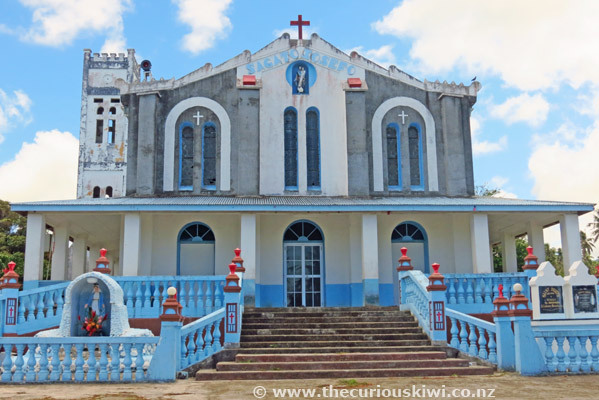 The roof of the church collapsed as lava flowed through and what looks like a corrugated iron pattern is imprinted on the solid lava that is now the church floor. 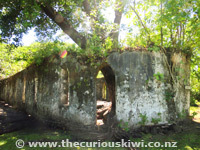 The stone walls of the church stayed upright and trees and plants have taken root in the cracks and crevices and are building a green canopy around the walls. Surprisingly no lives were lost during the eruption despite five villages being buried. The short tour costs $5 tala adults, $3 tala children. The walk can be managed in jandals but if you want to follow the lava flow to the coast sturdy shoes would be better, you'd also need sunscreen and plenty of water. PS. 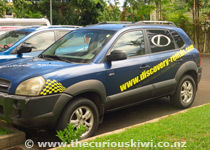 If you're adventurous and want to climb to the Mt Matavanu crater and meet the 'Craterman', these reviews will give you some useful information. 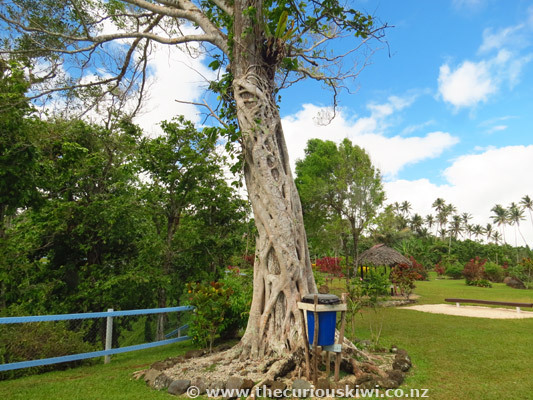 If you've visited this page before you will have read about the dubious garden fale that we stayed in on our trip in 2009, these fales are no longer used as guest accommodation. 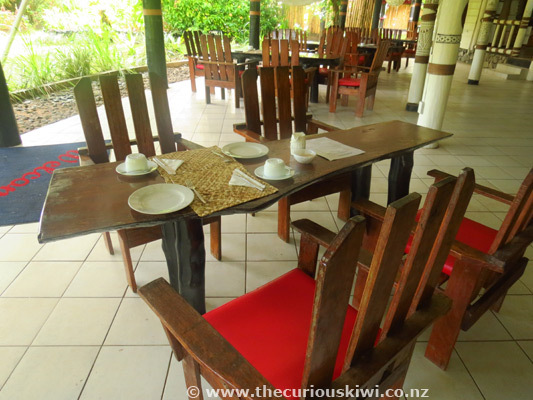 We were invited back to Stevenson's at Manase in 2014 to see and experience the different accommodation options now on offer. 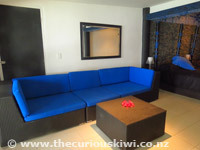 We spent two nights in the blue Nikolai Suite, suites can be booked on Stevenson's website from $550 tala twin share. Dreams of tropical paradise don't include being unwell, but I was on our first night in Savaii. I was grateful that I was in a suite with a comfortable bed, air conditioning, a fridge to keep our water cold, and had my own bathroom. 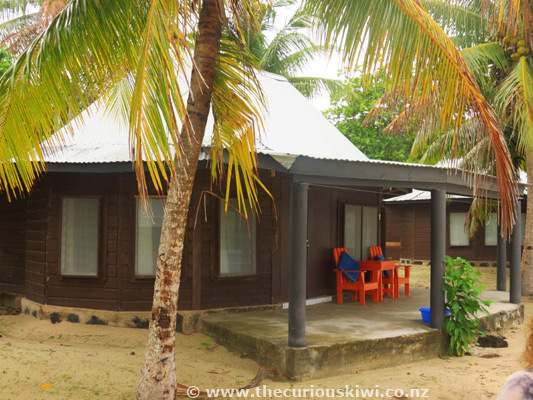 I'd recovered by the next day and waking up to a sea view enticed us a few short steps to the beach for an early morning swim and snorkel. The suites are very comfortable accommodation, the rock ensuite bathrooms are unique, although the shower tips water on you instead of spraying it. 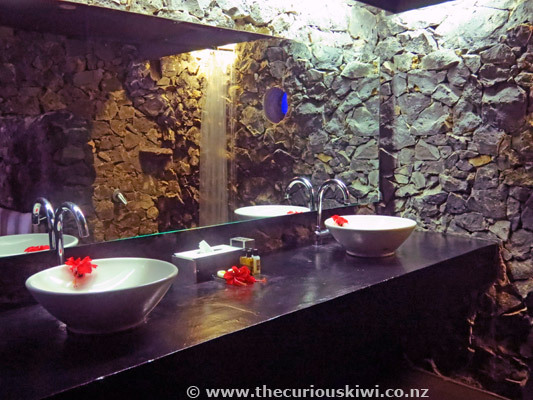 Each suite also has an outdoor shower of the spray variety, ideal for rinsing sand off after a swim (not private enough for an actual shower). 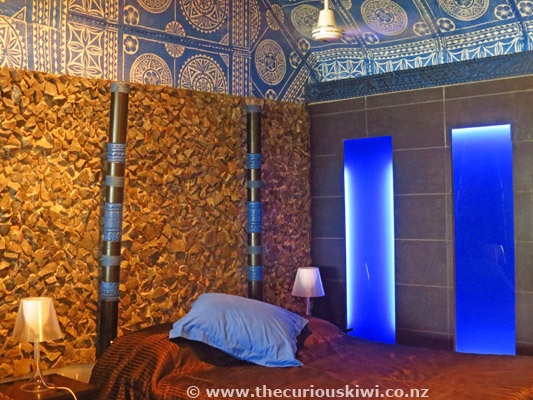 The bright blue colour palette in the suite took a little getting used to but one of my favourite features was the blue and white ceiling with its island style pattern. The blue wall panels can be switched on for low light at night so they turned out to be a good feature too. 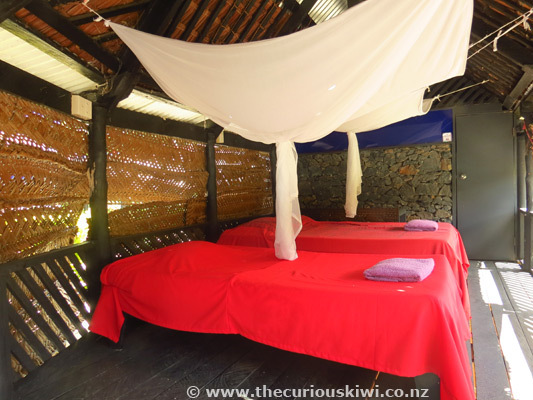 The Beach Villas have a more traditional island style decor, air conditioning, private outside shower, and fridge with tea and coffee making facilities. 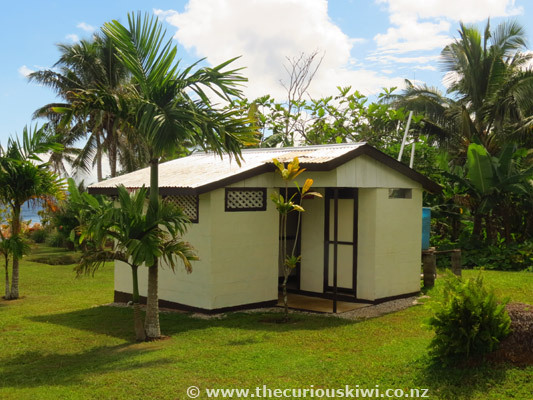 The outdoor shower area could do with a spruce up but in such a warm climate it's a novelty to be able to shower outdoors. 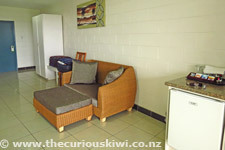 Beach Villas can be booked from $400 tala twin share. Euro Fales are the other option, they're more rustic accommodation similar to other fale operators in the village. The bonus of Stevenson's Euro Fales are that they have lockable ensuites with a safe, ideal for storing expensive electronic bits and pieces. They also have a fridge which is invaluable given the heat and the amount of water consumed. 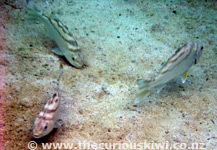 The Euro Fales face the sea but are also in the shade, and have a covered patio to help keep them cool. 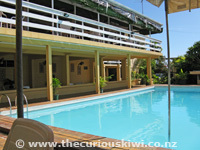 Euro Fales can be booked from $280 tala twin share. 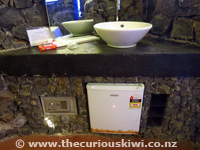 PS: Definitely take a torch with you as there's not a lot of exterior lighting around the accommodation. All room rates include a basic breakfast of toast and fruit, or pancakes and fruit. 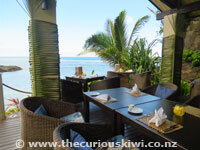 Cooked breakfasts are an optional extra from $10 tala. 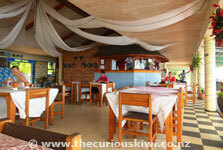 Breakfast is served in the spacious Tusitala Restaurant which is directly across the road from all the accommodation. 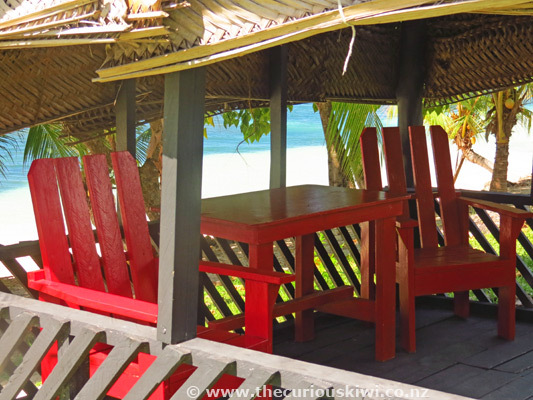 A new addition since our last visit is the Beach Bar, it's a good spot to enjoy a beach side lunch (from $10-$35 tala) or watch the sunset at the end of the day. 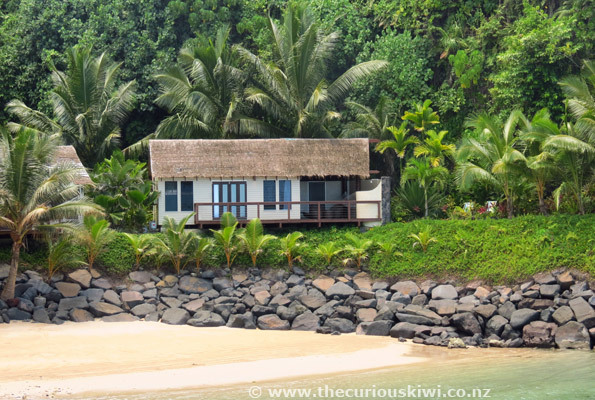 We chatted to a couple staying at Jane's Beach Fales and they said there were few people at their end of the beach so they liked to visit the Beach Bar to see other travellers. The Beach Bar is worth checking out if your chosen fale operator doesn't have a restaurant or bar and you're looking for a change of menu for lunch, or cocktails by the beach. (PS. 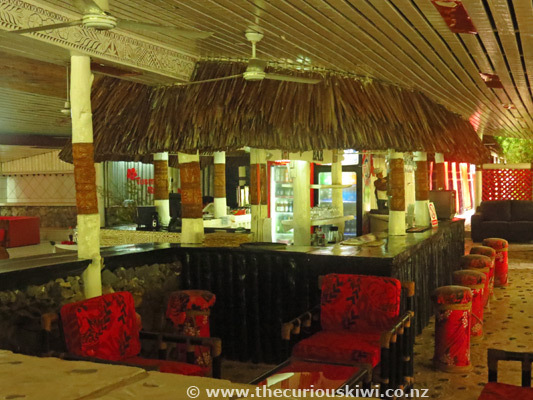 All seating at the Beach Bar is outdoors so it closes when it's raining, head across the road to Tusitala Restaurant & Bar). Comments to date: 21. Page 1 of 1. Hi, we are very excited to go to Samoa (first time) in May. We're staying at Coconuts and found you reviews of Samoa to be very insightful indeed. 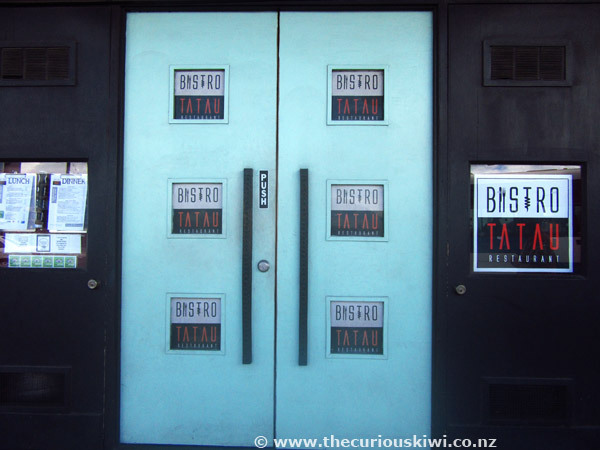 Kia ora. Admin: Kia Ora, I hope you have a really good time in Samoa, it's exciting to go somewhere new. 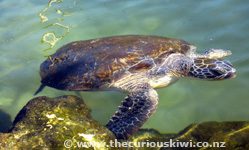 Coconuts is in a lovely location, I hope you get to see some turtles in the wild there. It appears the website for all the Fales and accommodation isn’t working. I’m hoping go to go in September but having difficulty booking Fales. Any news of a new website? Admin: Hi You're welcome, and thank you for the heads up about the broken fale links. 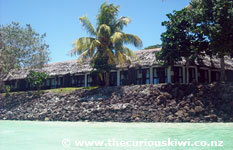 Samoa Hotels website may no longer exist, or maybe it is offline being updated, I'll follow up and see. 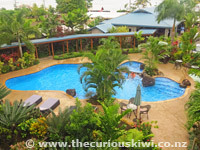 In the meantime I have redirected the links to Samoa Tourism Authority which has a list of beach fales - http://www.samoa.travel/accommodation/beach-fale-accommodation-in-samoa and some of those have a booking link. 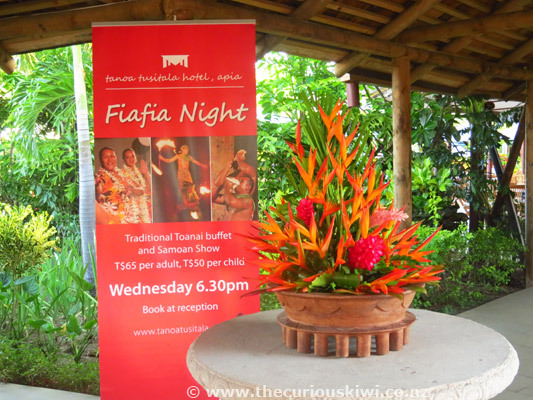 The other thing you can do is Google the various fale names individually and they may come up on booking engines like booking.com. Because the fale operators are small they often don't have their own website or even a Facebook page so it makes it a little tricky to find and book them. Happy travels in September. 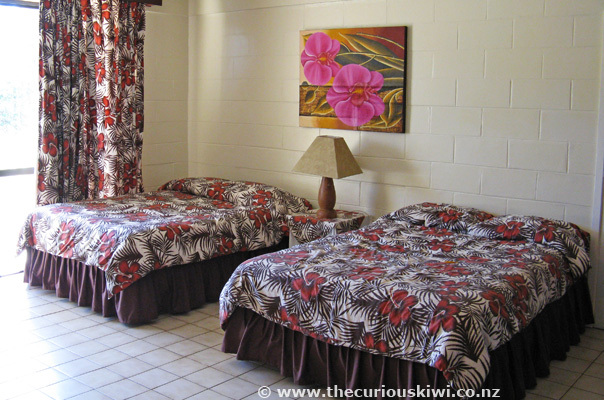 You're most welcome, hope you love Samoa and have a memorable trip. Only 6 more sleeps to go! Thanks. On Savaii chances are you will be eating where you are staying, unless you have a rental car, or a resort is in walking distance. 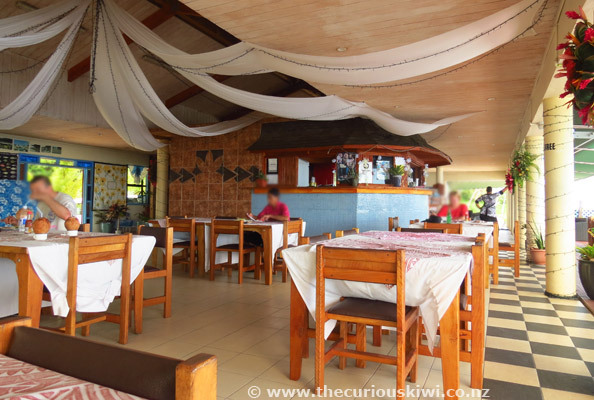 If you book an open fale on the beach, the price usually includes breakfast and dinner so most meals will be included in the rate. 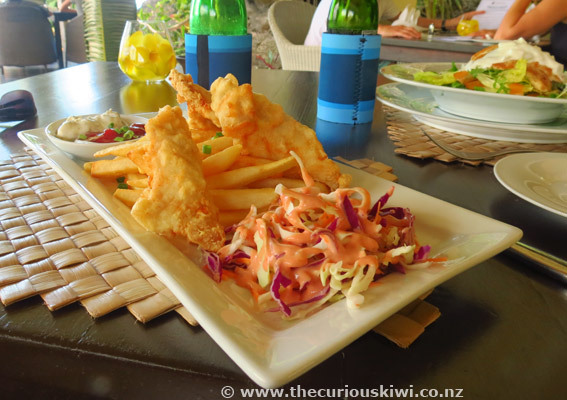 If you stay at a resort, breakfast is usually included and you pay extra for lunch and dinner, although some may have meal plans you can pre-purchase so you know when you book how much you will be paying for food. 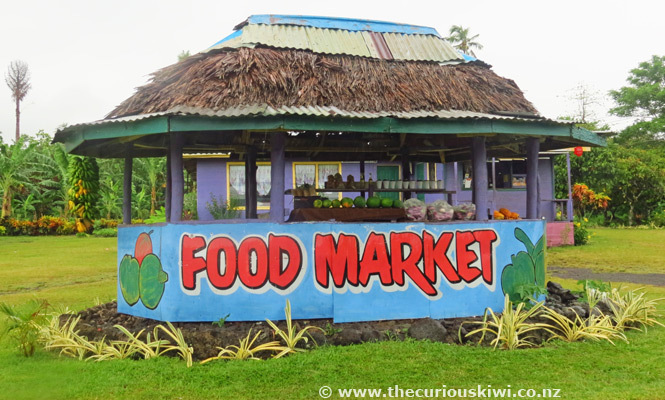 This is a great review site - I'm planning a 2018 trip to Savaii and I've learned a lot about getting to and around the island from this site - would love to learn about possible food costs .. 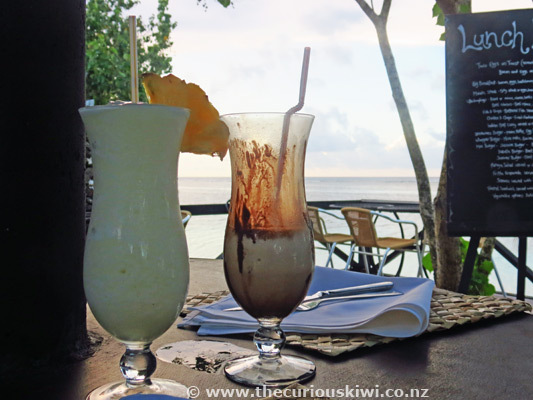 I can't be much help sorry, but suggest that you email Samoa Hotels (see link above under Useful Information) for some options. They are in the Visitor Center in Apia and specialize in accommodation. 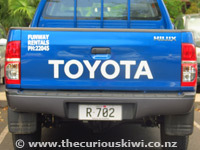 Given you're planning a day trip I would recommend a rental car so that you don't waste time waiting for buses which could be few and far between. The buses are more for locals than tourists so they won't necessarily stop at the sites unless you tell the driver where you want to go or ask a local where you should get off. Thanks. Currently there is one sailing on Sunday, although I don't know whether that ever gets cancelled at the last minute. For peace of mind I would probably go on Monday, then you won't be worried about it. 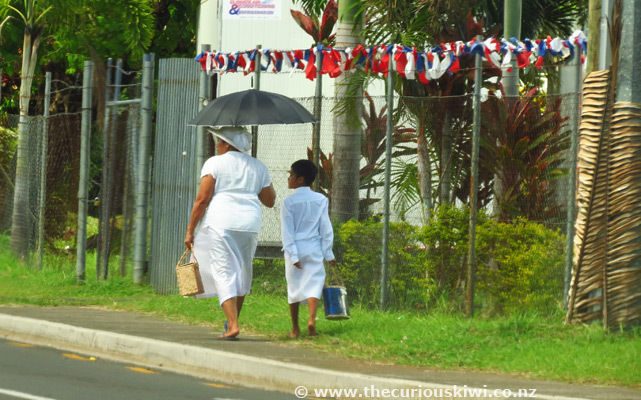 If you're staying in Apia there will also be plenty of taxis around and the bus on a Monday if you need them to get to the ferry terminal. 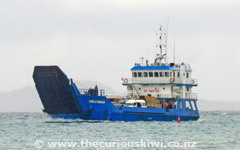 If you're taking a car on the ferry, pre-book at the ferry office in Apia to make sure there is space for the vehicle. Happy travels for May '17. 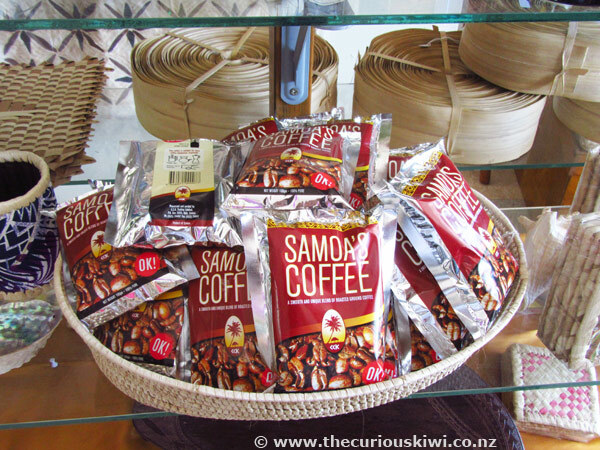 This has to be one of the best reviews that I've read about Samoa. My partner and I are heading over in less than 2 weeks and this gave us a heads up on costs and what to see. 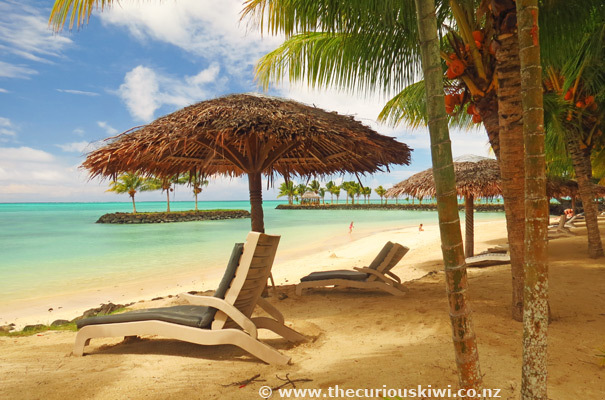 We're staying at Aggie Greys Beach Resort and your photos have made it look amazing. Thanks for your comments. 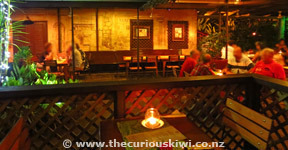 I've read some good reviews about Outrigger recently, and that's a great recommendation for Litia Sini. 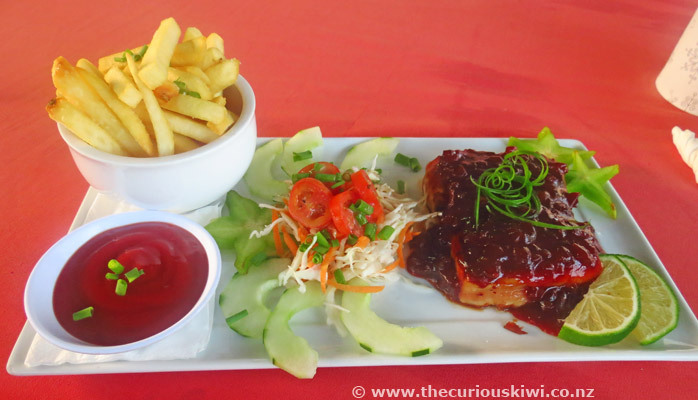 Samoa Guide updated November 2014. Stevensons at Manase now has 15 'Euro Fales' which all have a private ensuite, 5 air conditioned villas and 6 modern suites. The garden villas haven't been sold for a while now, but construction started on them today to make them lovely and less 'chicken coopy'. Come, stay and see! Admin: Hi Megan, thank you for the update. Our information needs to be refreshed, it was also one of the first things I wrote for the website and it shows. We are planning to return to Samoa in the next few months so we may just come stay and see.